In case you missed it, my recap of the Mohegan Sun BrewFest was published yesterday! A new restaurant review too! I fluctuate between feelings of nausea and feeling pretty-OK-but-something-is-still-off. Obviously I am grateful that I felt well enough to go to the BrewFest on Saturday night and have a good workout Sunday morning, and even a pleasant Sunday doing errands, blog work, and homework. But I woke up yesterday (Monday) ill again and I’m getting sick of being afraid to eat my favorite things like salad beasts, cottage cheese, and peanut butter! Today has just been more straight-up nausea. I know that there are many folks out there who have GI issues ALL the time. So I feel bad complaining. And also feel much more aware of how lucky I am to have the healthy body I have! 99% of the time I am a healthy and happy camper. I didn’t even get a cold last fall/winter (and I hope I’m not jinxing myself, but it doesn’t matter because I’ve already said this a few times this year). The body is an amazing thing and when I am feeling ill, no matter how so, I am more driven than ever to take care of my body. 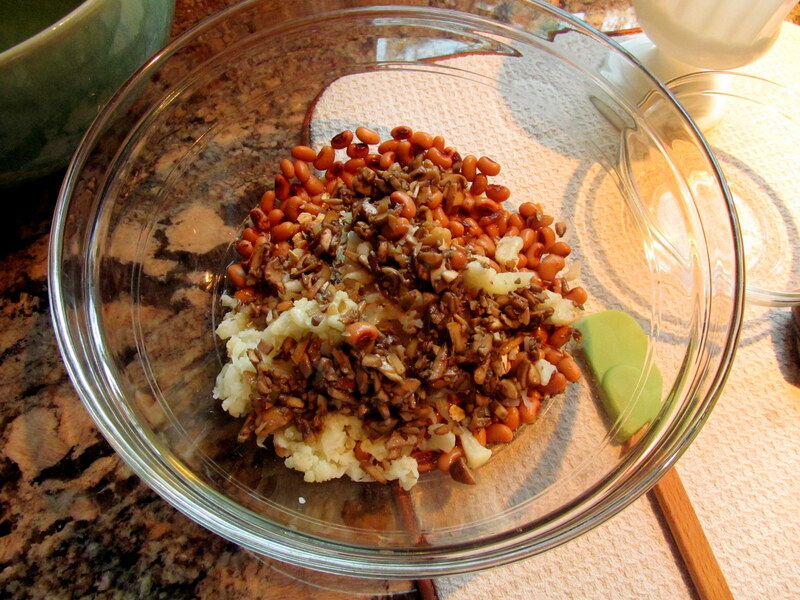 Heated mashed banana mixed with plain Chobani. Completely safe and oddly comforting. At least I didn’t have too many plans this past weekend with the exception of dinner out with my mom on Friday night and the BrewFest Saturday night. Plenty of time to rest during the day. I just am hoping my body will decide whether or not it wants to get better soon because I’m not a fan of the flip-flopping. And I also hope my body flips to the get-better side and stays there. Right now it seems to be staying nauseous. Wrong way, body! 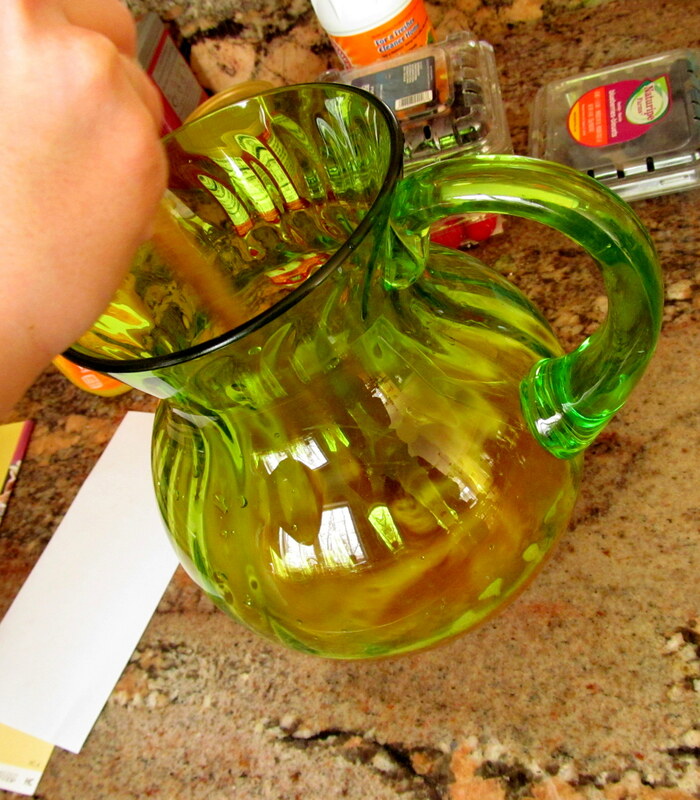 Nope that’s not coffee – it’s a ginger herbal tea called Evening Comfort Tea! Mom brought it home for me from Daybreak. I miss my coffee but have had an off-and-on appetite for it. On Sunday afternoon while I was at home being productive, I took some photographs of a beautiful bowl I received from Macy’s via the Everywhere Network. The bowl was sent to me to review as part of an effort to spread the word about the Path to Peace Collection. It reminds me of the sun! 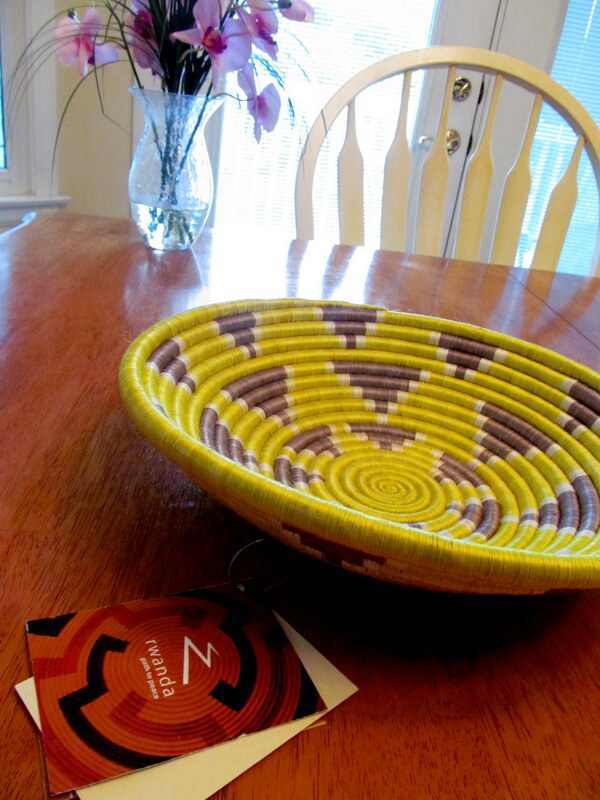 Macy’s first started selling these handmade baskets, exported from Rwanda, in 2005. Since then, they have contributed to Rwanda’s exports a great deal. The program is part of a mission to help the country via “trade instead of aid”. The idea is the support of Rwanda via increased awareness among US citizens of the beautiful products that can come from that country and its people, so that they can remain self-sufficient. 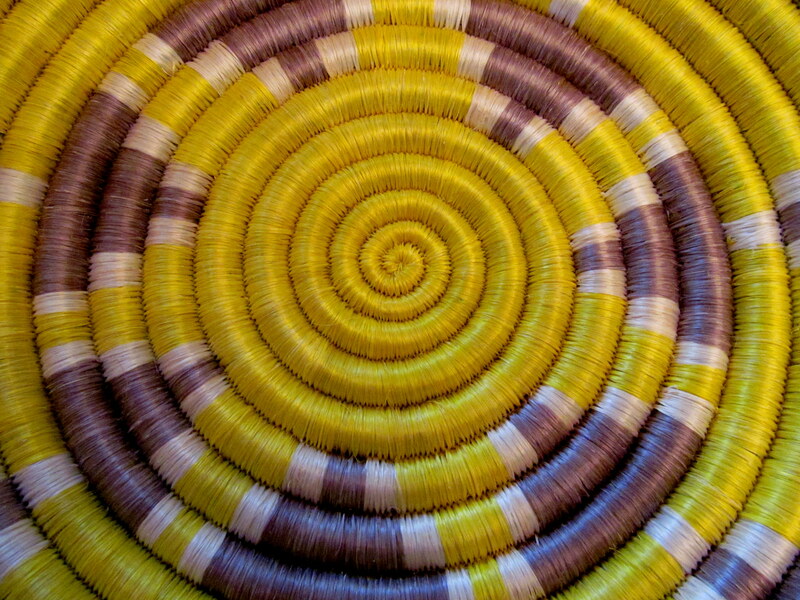 You can check the collection out here – some of the bowls are breathtaking. I do enjoy when a product is sent to me with a handwritten note! Macy’s purchases the baskets from the weavers, who not only gain a source of income, but also pride. 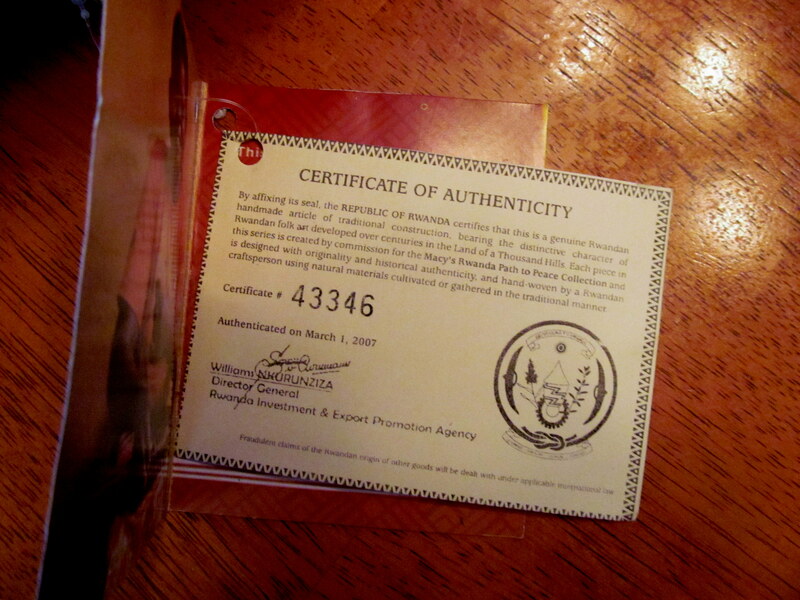 Each basket comes with this tag of authenticity. 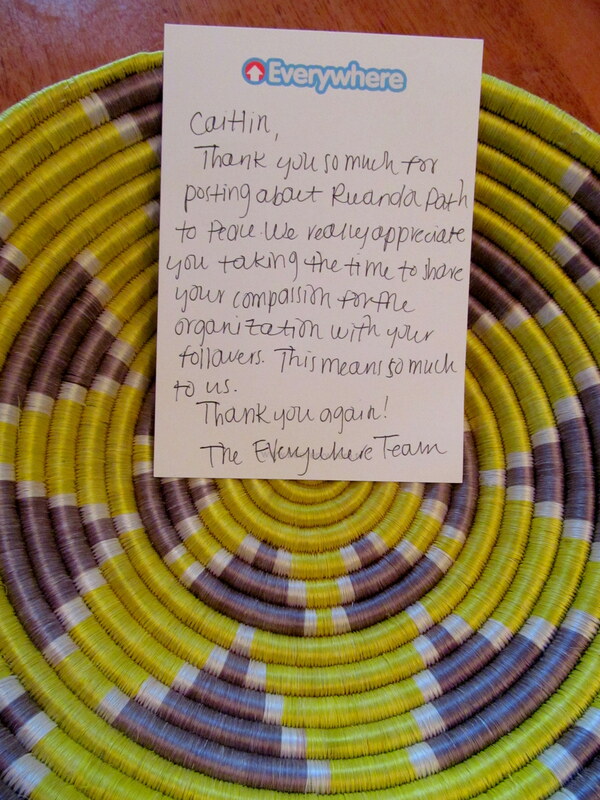 Anyone who purchases a Rwanda Path to Peace basket can be confident that he or she is directly promoting the well-being of that basket’s weaver. This practice reminds me of Fair Trade products – making sure that someone producing a product is getting a fair amount of income from it, and a place to sell that product too. I don’t usually do these kinds of posts, but I wanted to take the time to do so because it’s a great cause and if I am able to write a blog post about this and spread the word, why not? Even if only one person ends up buying a basket because he or she sees a retweet from another tweet from a Facebook status from this post, at least I will have somehow helped that basket’s weaver – I don’t even need to know that I did. The detail in these baskets is pretty incredible and I love how malleable they are. Completely easy to store when not in use, and easy to transport too if needed. Check out the entire collection – you might like what you see! 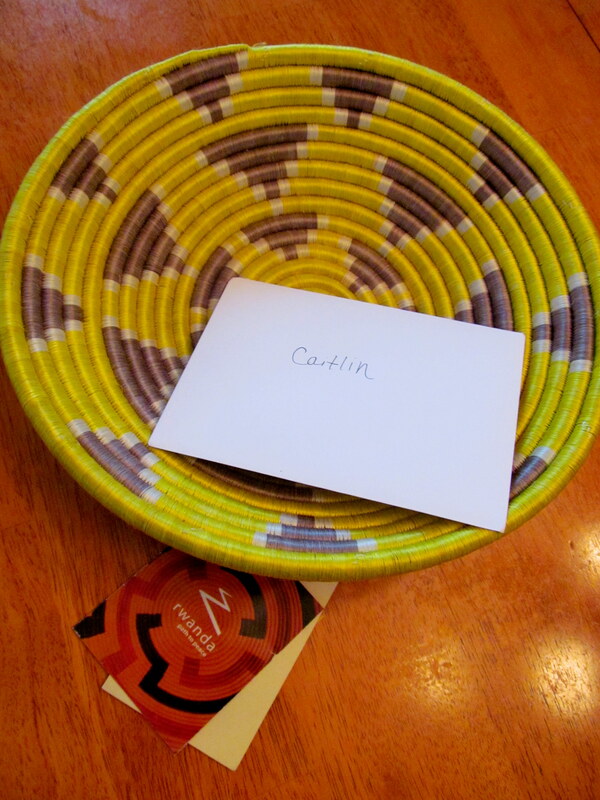 I received a basket from the Everywhere Network to review. All thoughts and opinions are my own. Have you ever used your blog to support a charitable cause? 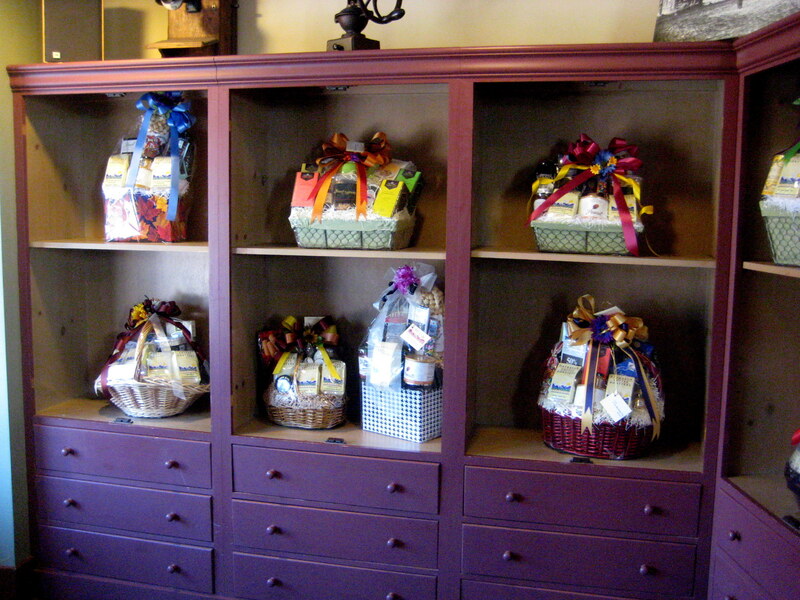 Did you see any baskets on the website that you liked? 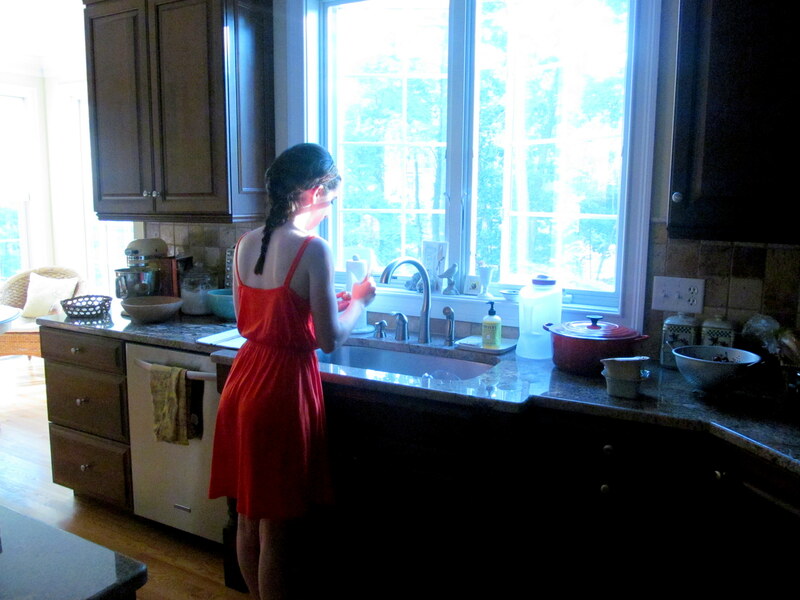 Have you ever had an illness that seemed to linger? How did you handle it? BIG News and Knoshbox Giveaway! Don’t forget to check out yesterday’s post if you’re a CT resident – it contains some special instructions about how to possibly get into the VIP portion of Cuvee‘s 3rd Anniversary Party in West Hartford next Thursday 8/30! Before I get into today’s review and giveaway, I have big news for you guys that I’ve been holding off on sharing until after I was done recapping the 2012 Healthy Living Summit. On Monday I was contacted by Ripe, a local company that makes 100% natural drink mixer juices. They, along with Onyx Moonshine (another favorite local company of mine) and Morton’s of Hartford, are sponsoring a Farm-to-Shaker Bartender Challenge at my favorite CT farmer’s market, the Coventry Regional Farmers’ Market, on Sunday 9/9 at 2:30PM. Area mixologists will be asked to use ingredients from the day’s farmers’ market offerings to make unique cocktail creations. Adding a local twist to fancy beverages?! This has ME written all over it! And Ripe thought so too, because the reason I was approached on Monday was so they could ask me to be a JUDGE at this event! I enthusiastically, immediately accepted the “job”. I am not only excited to get a chance to sample all these cocktails, but beyond honored and pleased that my blog has accurately portrayed my passion for the most out-there, skillfully crafted, and simply tasty cocktails. 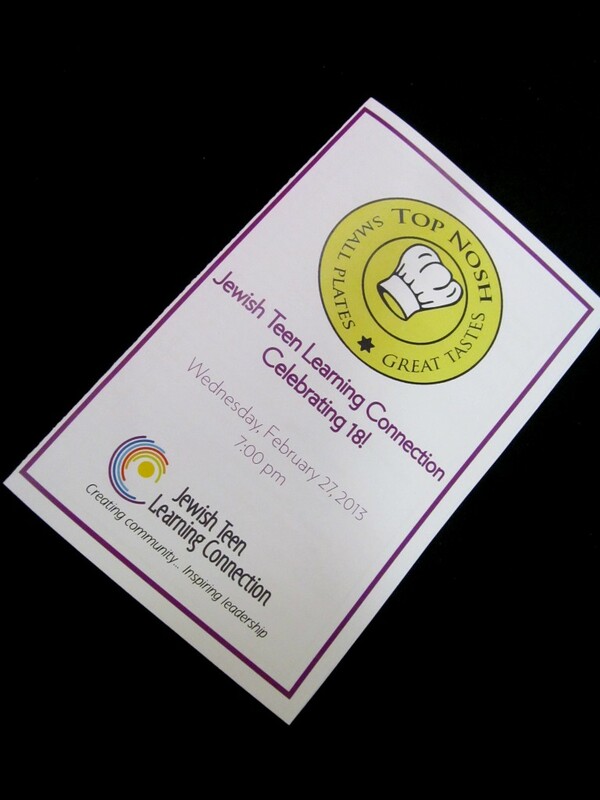 The fact that I was thought of as a good person to judge this kind of event means that I am doing a good job of being ME when I publish posts! And after having just tuned into the “I Am the Blogger in Your Neighborhood” session at HLS and feeling encouraged and reassured about my involvement as a CT blogger, this is only further proof that I am on the right path! My BB Heather just so HAPPENS to be visiting that weekend too (this keeps getting better) so she will be able to join my parents in watching me judge – and take photos/videos to show you all!!! Now let’s get into the goods. As in, good for you guys! 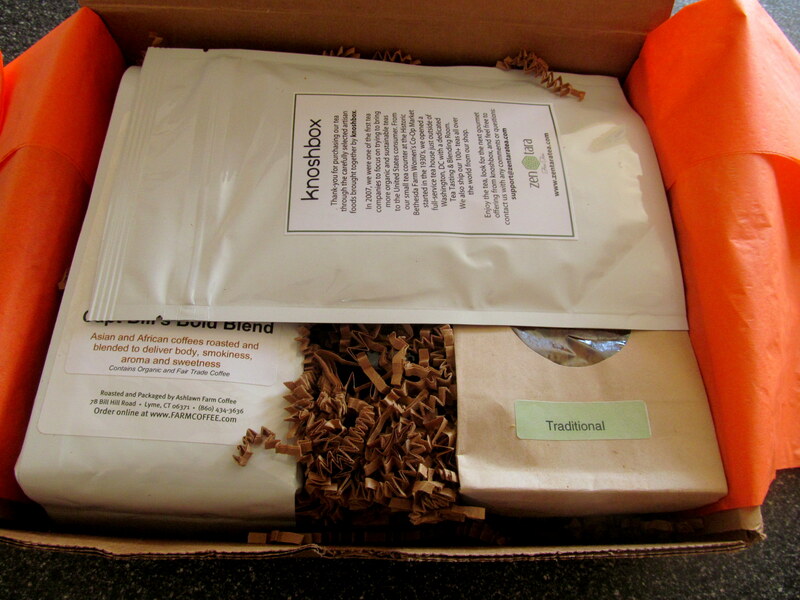 My friend Richard has utilized his local food expertise and started Knoshbox, a monthly subscription service that delivers local treasures to foodies nationwide. 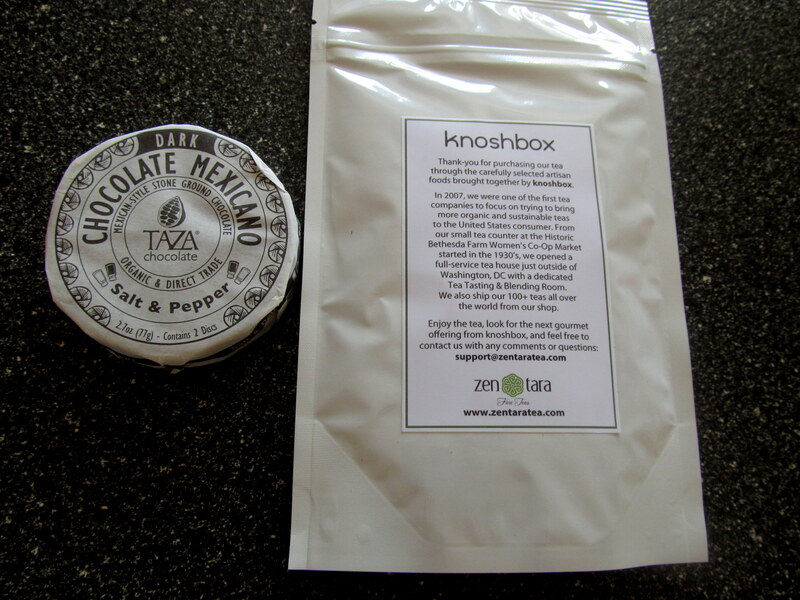 There are other food sample subscription services out there, but Knoshbox differs in a couple of ways. Firstly, the products Richard selects to send out each month are not produced by “big business” by any means. 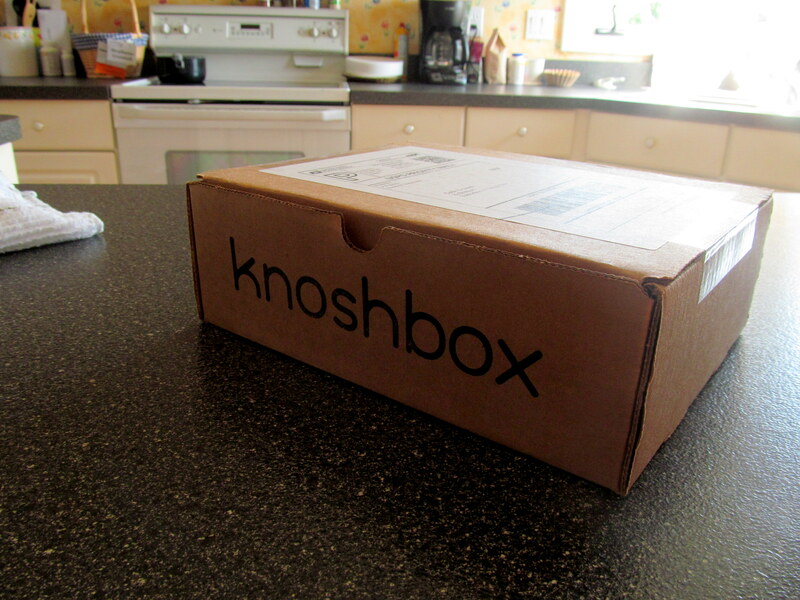 Knoshbox recipients can rest assured that the food they’re receiving is coming from sources such as start-up ventures or farms. Secondly, Richard is not sending subscribers sample items. 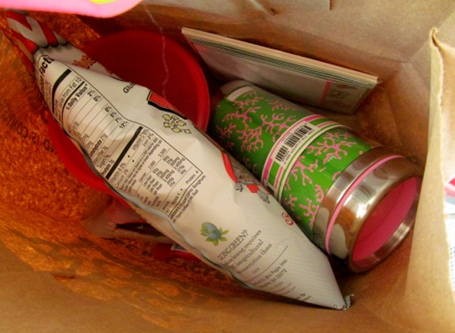 Instead, he sends out full-size items so that foodies have plenty to enjoy. Also, farms or start-ups might not already be producing sample sizes, so I think it makes sense and is considerate of the producers to not restrict Knoshbox items to those that come in sample sizes only. 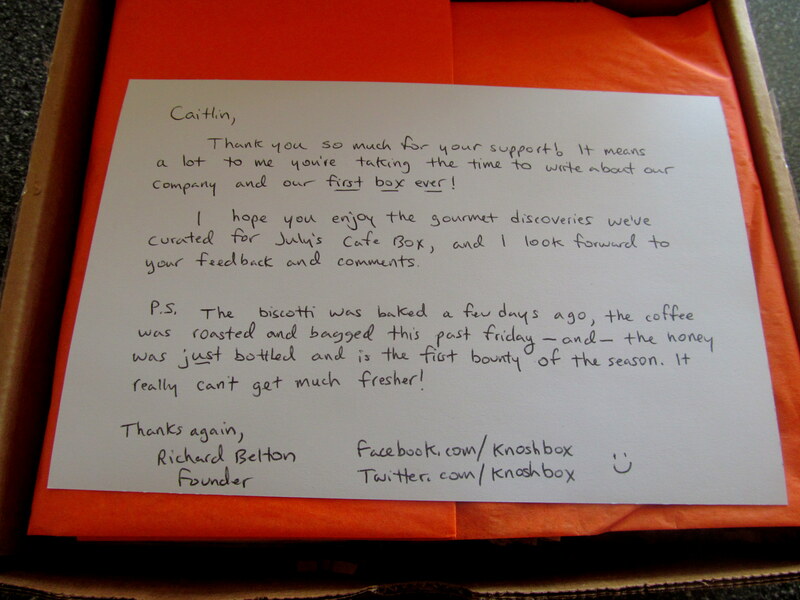 I was so excited when Richard sent me the company’s first box and even included a note explaining just how fresh the box’s contents were. 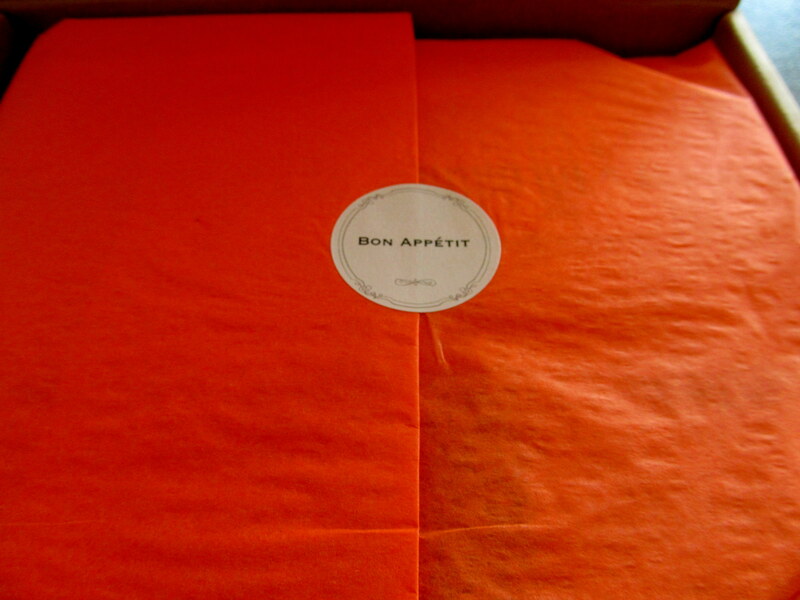 The words “a few days ago”…”this past Friday”…”first bounty of the season”…totally stood out to me and made me all the more excited to see what was inside. 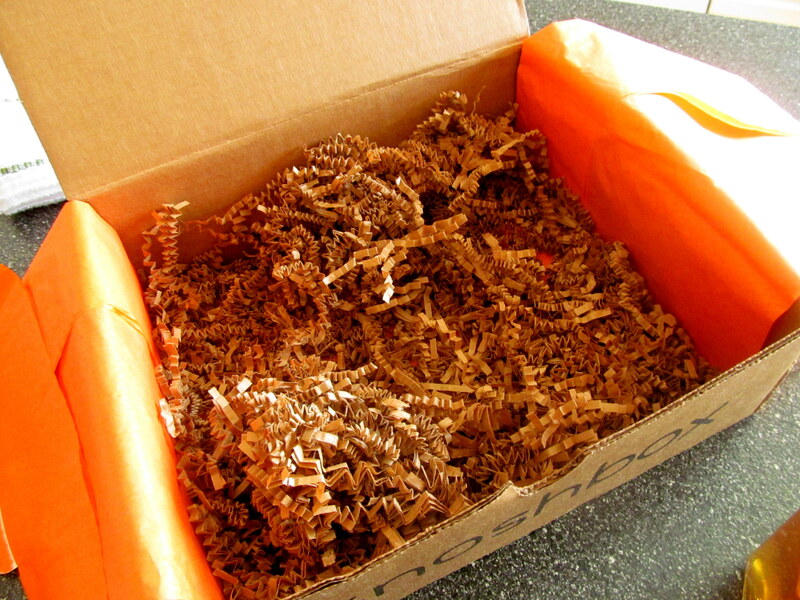 No, I’m just kidding, the box did NOT only include packing “potpourri”. But I thought it was way fun. 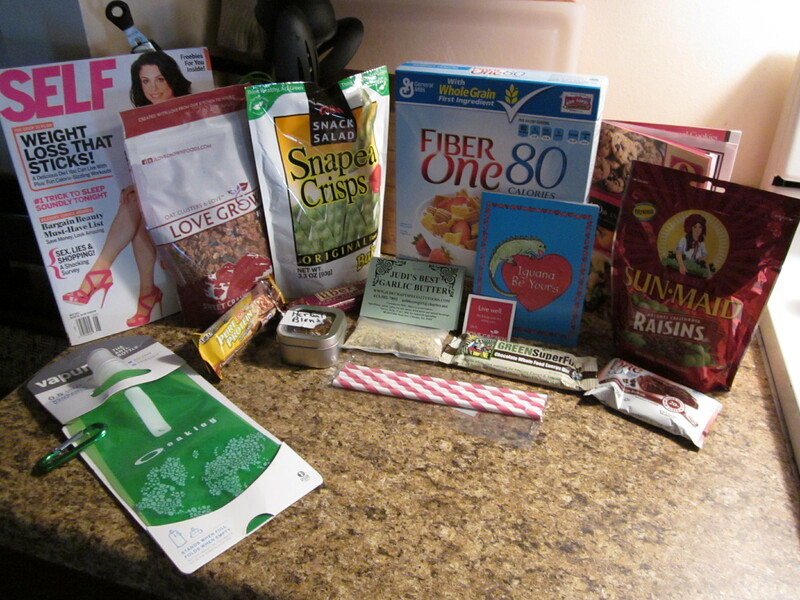 But seriously, my Knoshbox contained a variety of high-quality foodie treasures. 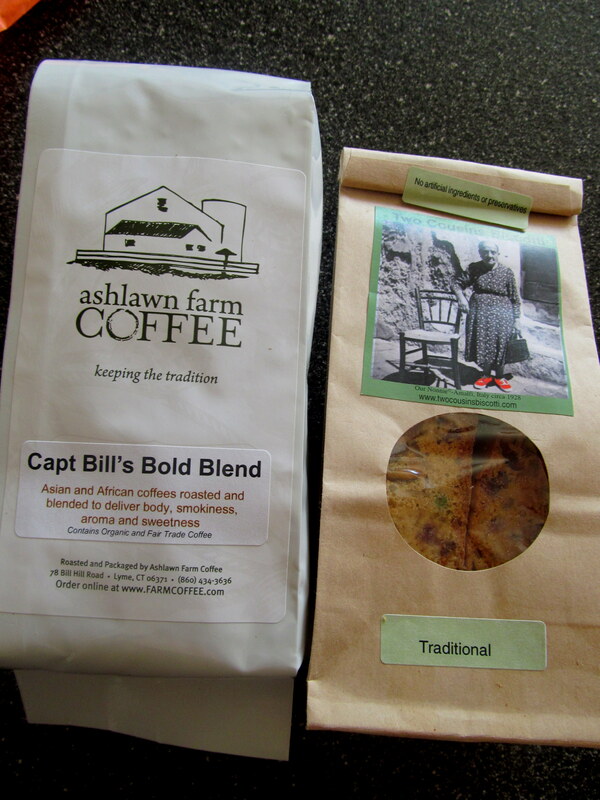 Ashlawn Farm Coffee: This bold blend contains fair trade and organic beans! I haven’t had a chance to use it yet since I typically don’t drink coffee I make at home, but my mom is excited to try it. The only reason she hasn’t yet is because the bag came with whole coffee beans instead of ground. This was a bit inconvenient, but I also understand it was necessary to preserve the freshness. 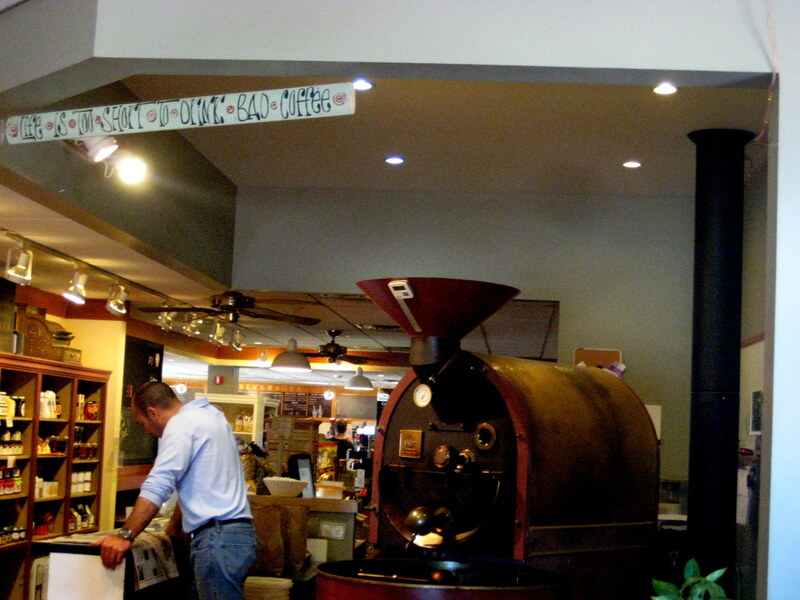 I love that it came right from a farm in Lyme, CT. I’d love to visit their cafe sometime. Zen Tara Tea: The Golden Meyer Lemon Black Tea is the perfect basic flavor, made with lemon peel and lemongrass. Zen Tara is a company based in Bethesda, MD. Two Cousins Biscotti: You probably have seen me tweeting away about having this as a late-night snack with my beloved plain Chobani. An Italian couple in Clinton, CT makes this authentic, complexly flavored biscotti. It’s the perfect mix of sweet and savory and each bite was like a surprise because I didn’t know if I’d hit a cranberry, a pistachio, or an apricot. Any of the three was welcome! Love that satisfying crunch too. Taza Chocolate: I raved about Taza when I tried their stone ground chocolate at CT Veg Fest and I’ll rave about it again here. Once again, plain Chobani provided an excellent place to mix in this salt and pepper dark chocolate. Such a rich flavor and the difference between Taza and other dark chocolate brands is totally noticeable. I was so excited to see it in the Knoshbox. Full Bloom Apiaries: It doesn’t get more legit than honey straight from those that do it best, like this apiary in Franklin, CT. 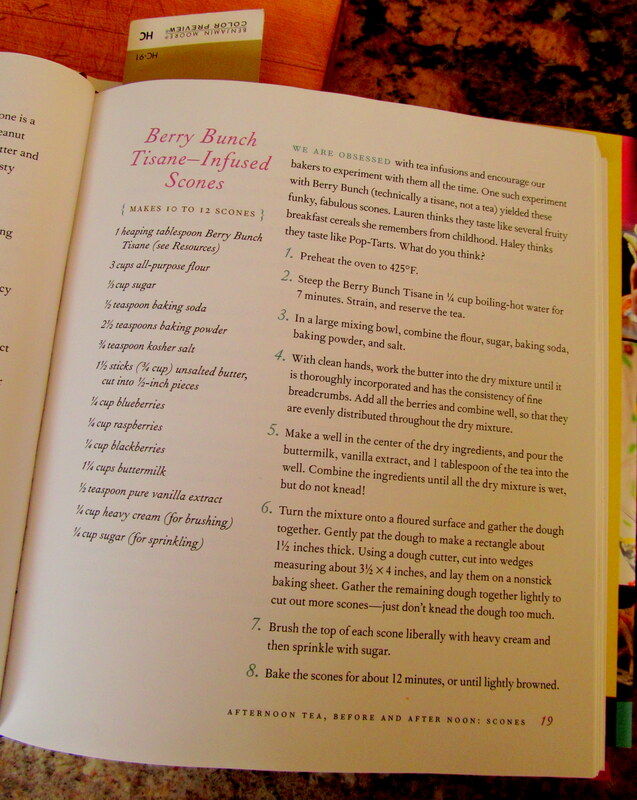 I have to admit I don’t use honey often but would love to find some baked good recipes to incorporate this into. My nighttime routine (for four nights since I had four biscotti) was having the biscotti crumbled in plain Chobani while I read my book! Head to the Knoshbox Market and comment telling me which local treasure you’d most want to try (mandatory). Follow me on Twitter and comment saying you did. Follow Knoshbox on Twitter and comment saying you did. 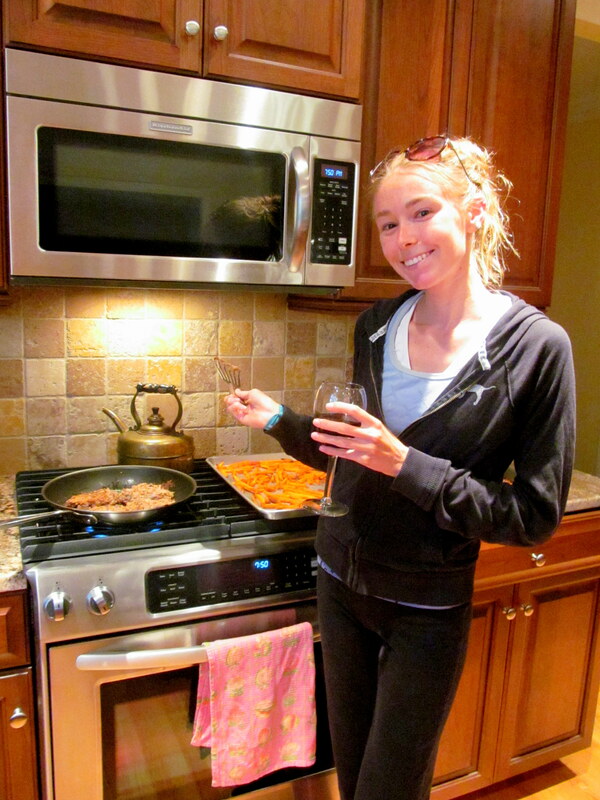 Tweet “I entered to win a @Knoshbox full of local foods from @CaitPlusAte! http://wp.me/p1SfTW-1nX” and comment with the link to the tweet. Follow me on Pinterest and comment saying you did. Follow Knoshbox on Pinterest and repin something from there. Comment with the link to the repin. Happy Monday! I’m not feeling too happy that it’s Monday but maybe if I repeat that greeting enough, it’ll actually rub off on me. Enjoy today’s baking (gasp!) 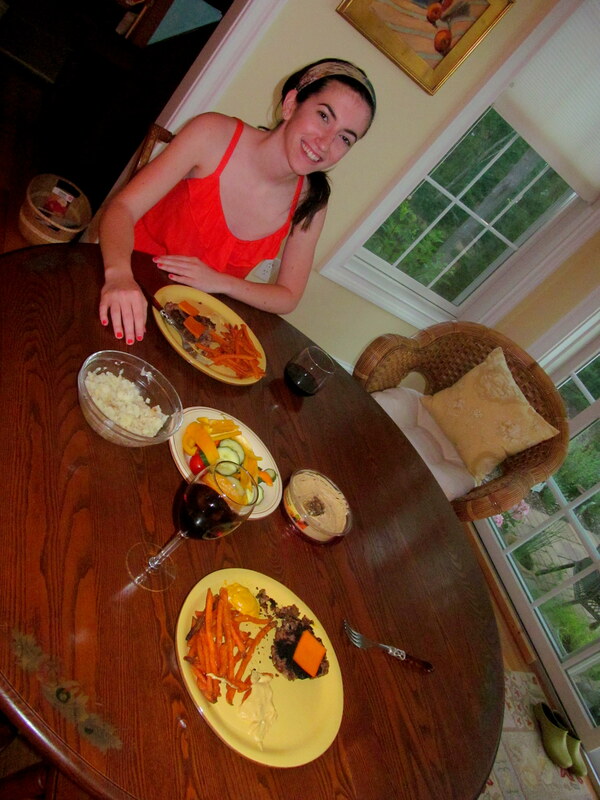 post and also be sure to check out my Healthy Page interview! Have you ever heard of Alice’s Tea Cup? It’s an NYC restaurant (it seems all the best are there!) with a few locations. This place serves up both food and drinks made with tea (the closest thing we have to that here in CT is Tisane in Hartford, which is certainly excellent). Of course, they also serve tea on its own, but if I can make loose leaf tea at home then I’d much rather have a unique infusion creation! Luckily the founders, Haley and Lauren Scott, have made it possible to have more than just Alice’s Tea Cup teas in your own home. 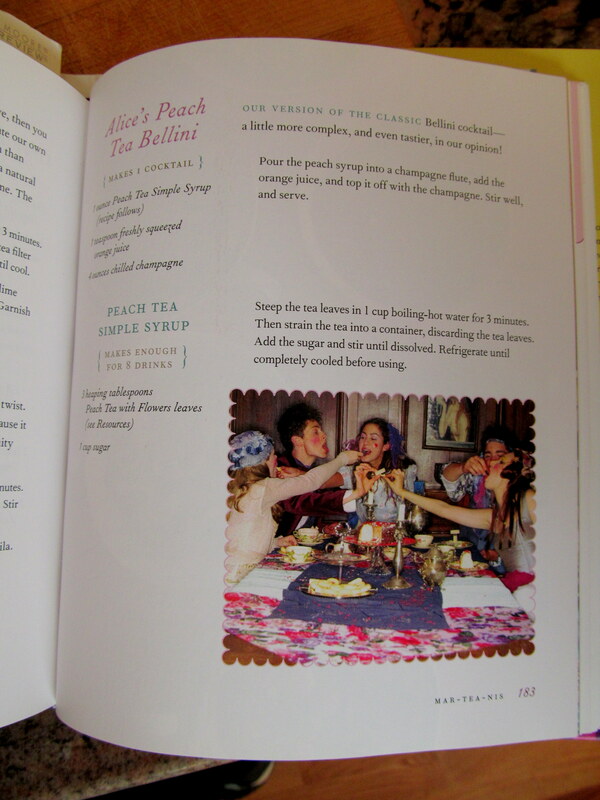 They published the Alice’s Tea Cup: Delectable Recipes for Scones, Cakes, Sandwiches, & More from New York’s Most Whimsical Tea Spot, a cookbook full of recipes drinks and food fit for all meals, some with tea and some without. 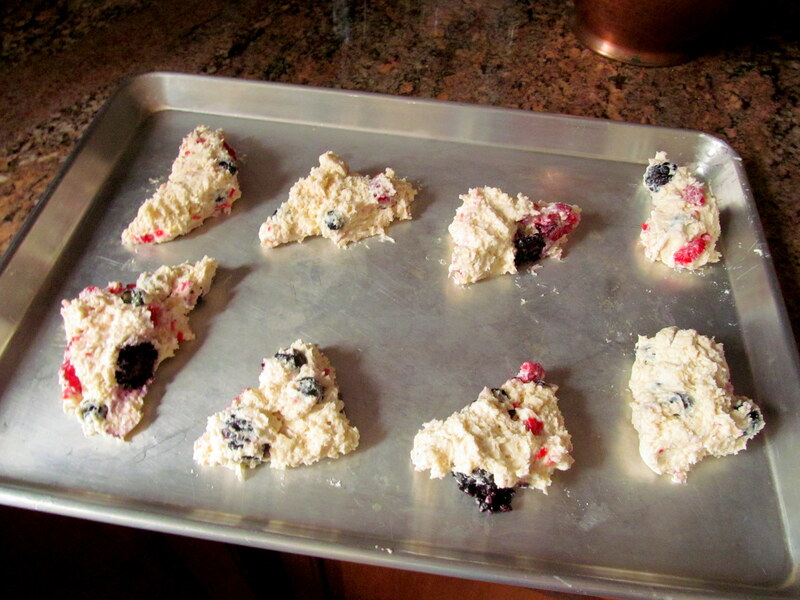 I used Splenda instead of sugar and fat-free buttermilk instead of regular to lighten the recipe up a bit! 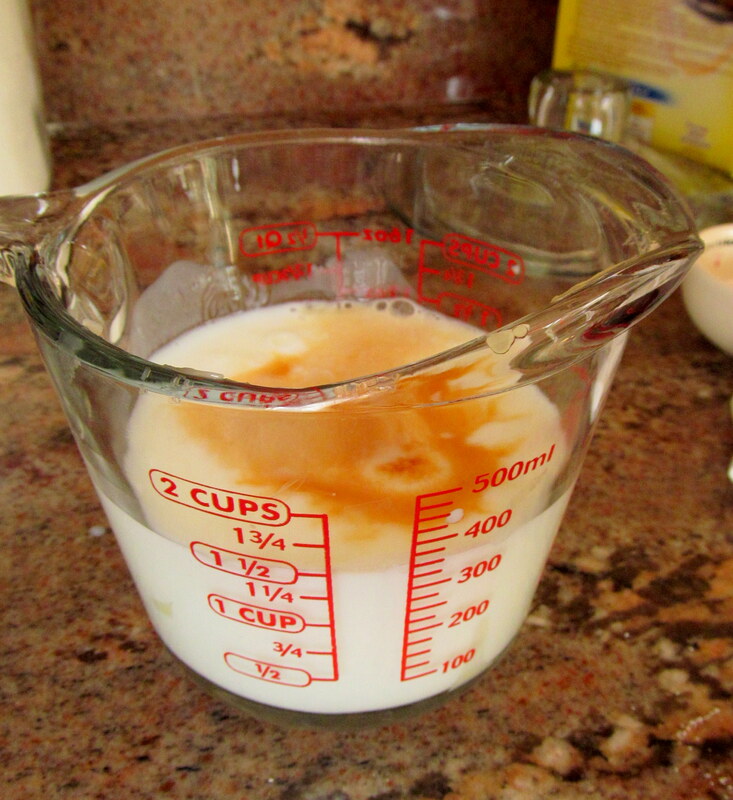 We also skipped the heavy cream and sugar topping. Hello, I want that mug. 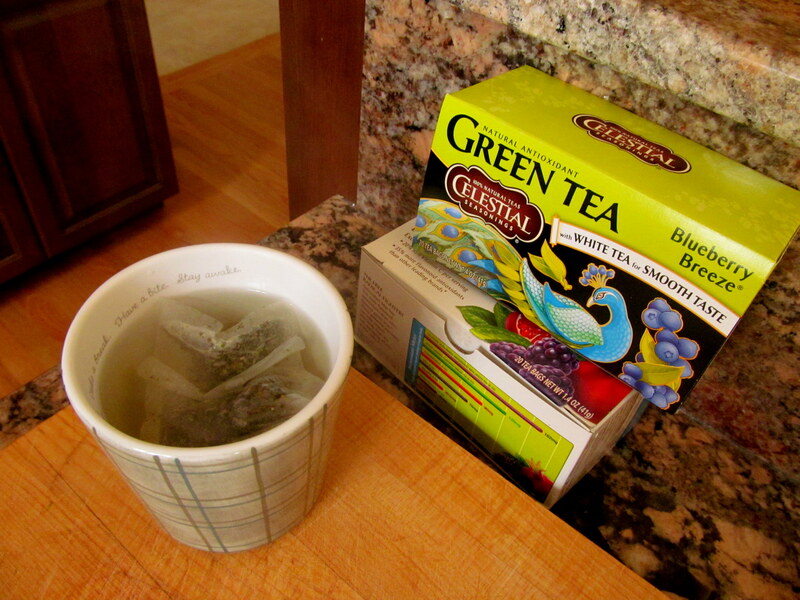 Kim didn’t have any tisane on hand, but her mom recommended a Celestial Seasonings Blueberry Breeze Green Tea (sadly looks like it’s been discontinued, but the website offers suggested replacements). 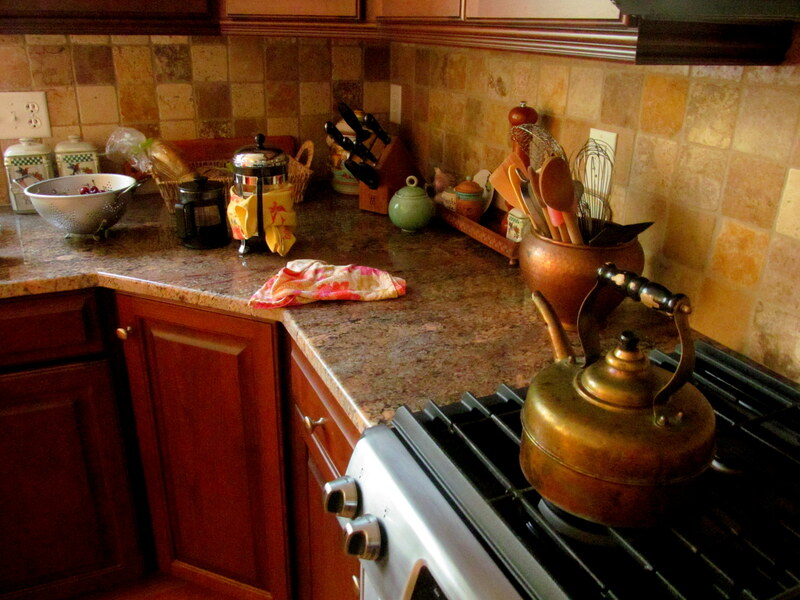 As soon as we put it into the hot water to let it steep, we knew she’d chosen a winner! 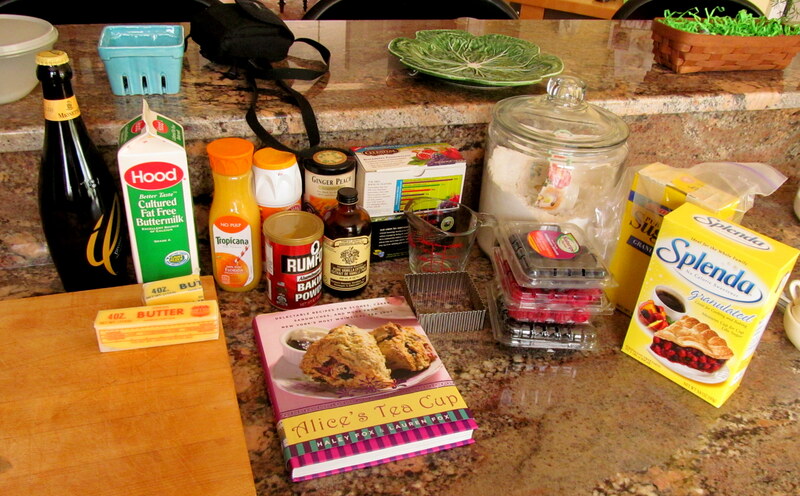 A pleasant blueberry smell filled the room and was a nice “background” to our scone-making. 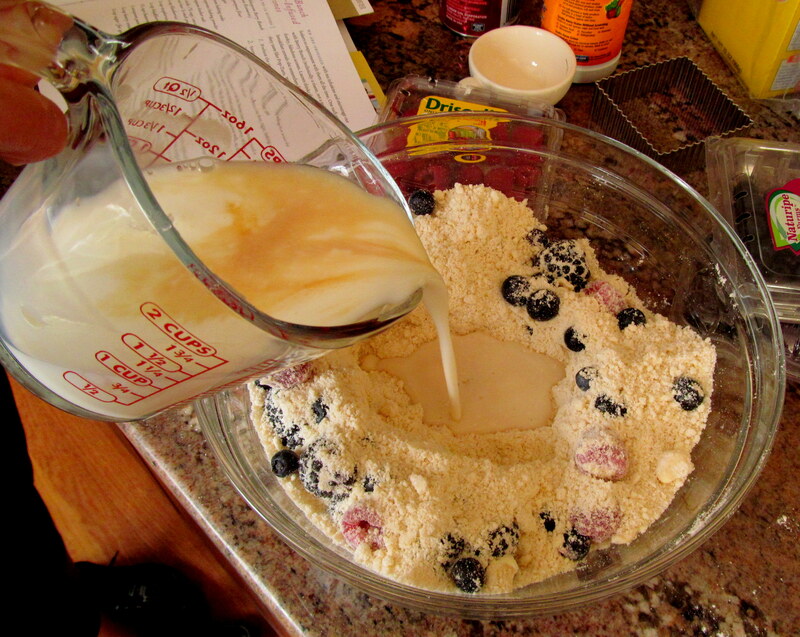 …and wet ingredients (buttermilk, vanilla extract, and the blueberry tea) were combined in another. 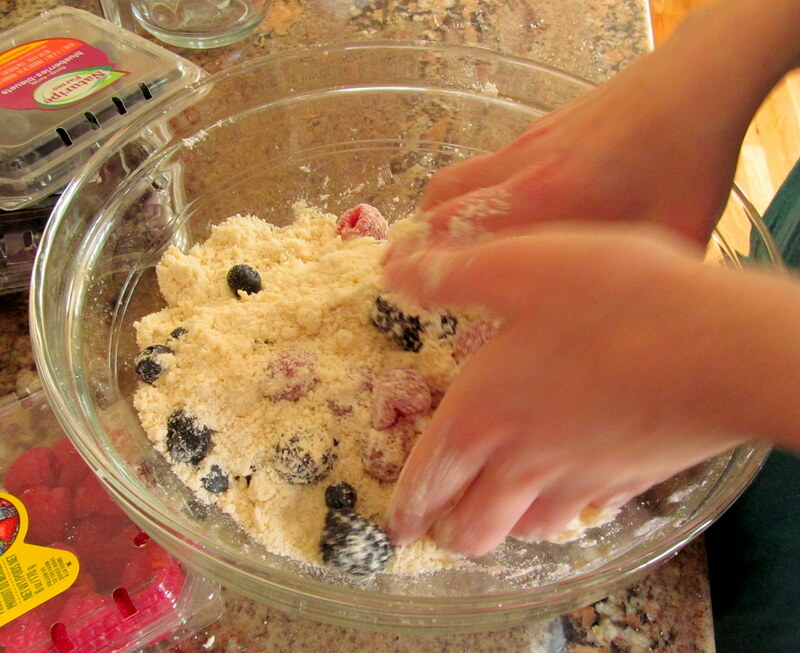 Keeping the wet away from the dry for now, we had to work the butter and blueberries into the batter carefully with our hands (to avoid too much berry-squashing). Um, don’t have to ask me twice! This was so much fun. 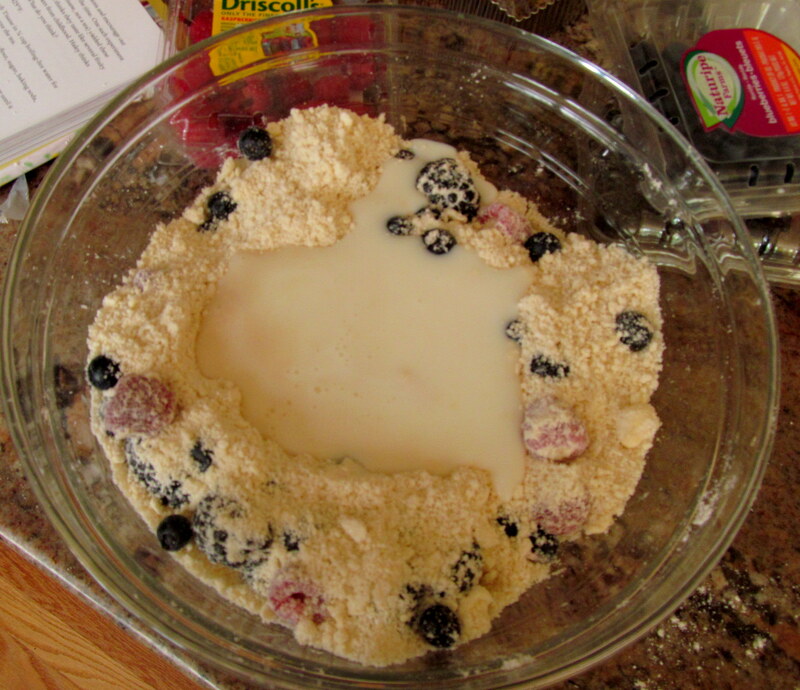 NOW it was time to make a well in the dry ingredients, butter, and berries and add the wet ingredients. 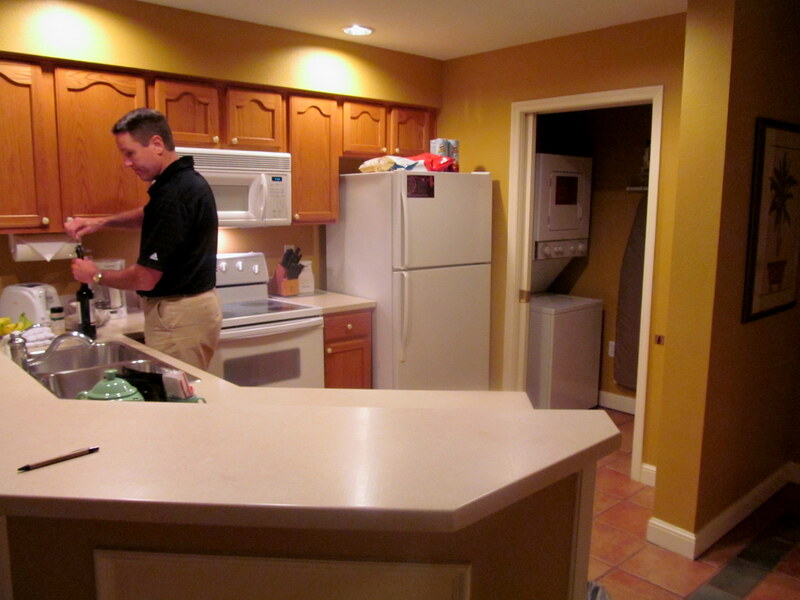 Attacked it all with a rubber spatula…don’t worry, hands would get to come into play again. 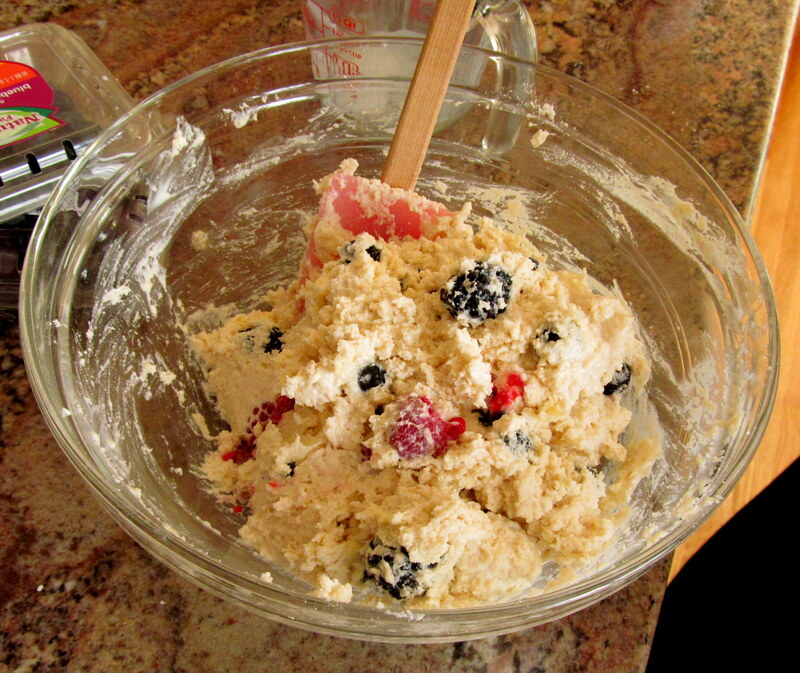 The rubber spatula was gentle enough to keep most berries un-squashed. 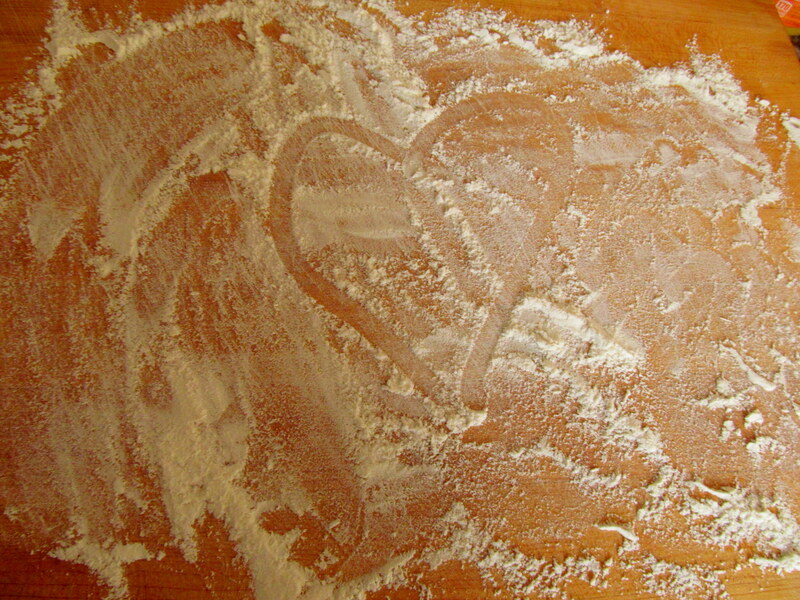 Fun dough playtime! 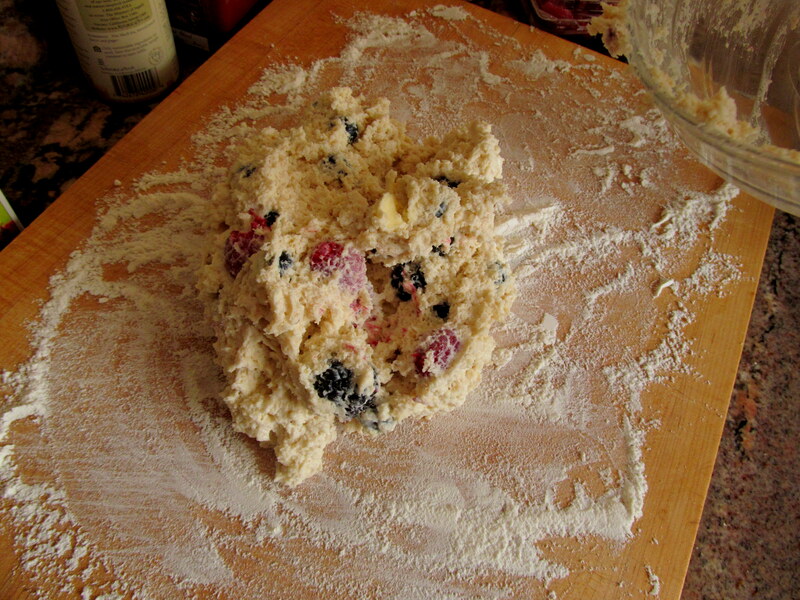 We sprinkled a cutting board with flour and got to work cutting the dough into scone shapes. 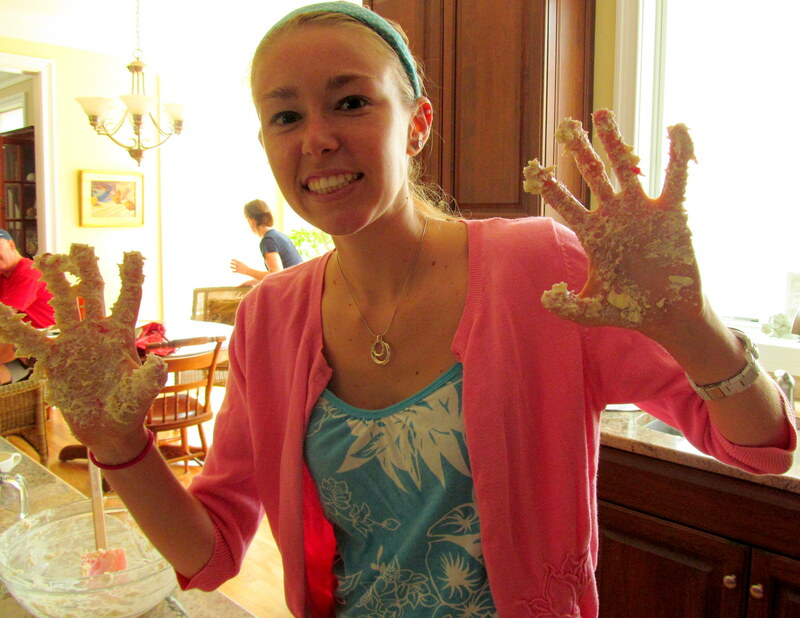 There were no photos taken of the scone-cutting because it got VERY sloppy. The Scone Monster made an appearance though. 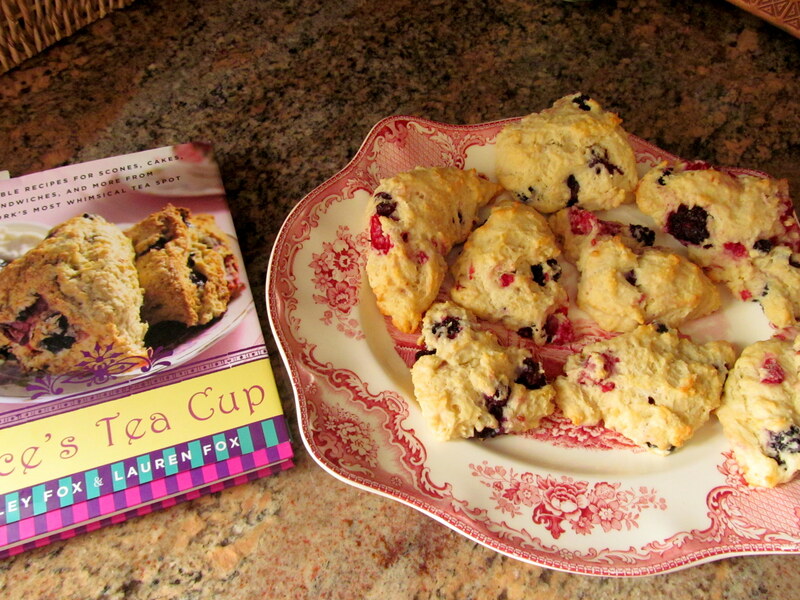 Even with her around, we still managed to get a few trays of only slightly haphazard-looking scones into the oven. This couldn’t have been easier to make! Kim brewed the peach tea before we even started on the scones, and then we added the Splenda (instead of sugar) and stirred. 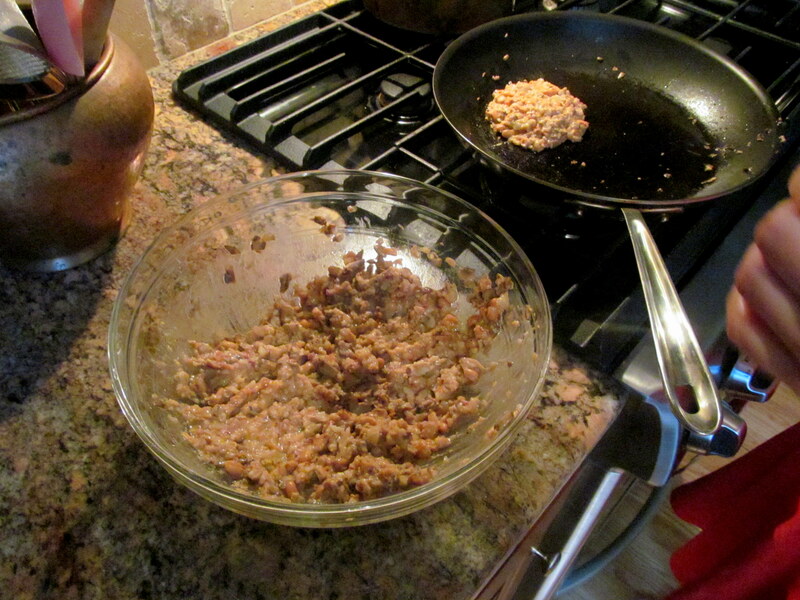 It made a nice simple (literally) syrup that we were able to let cool and coagulate (fun word!) 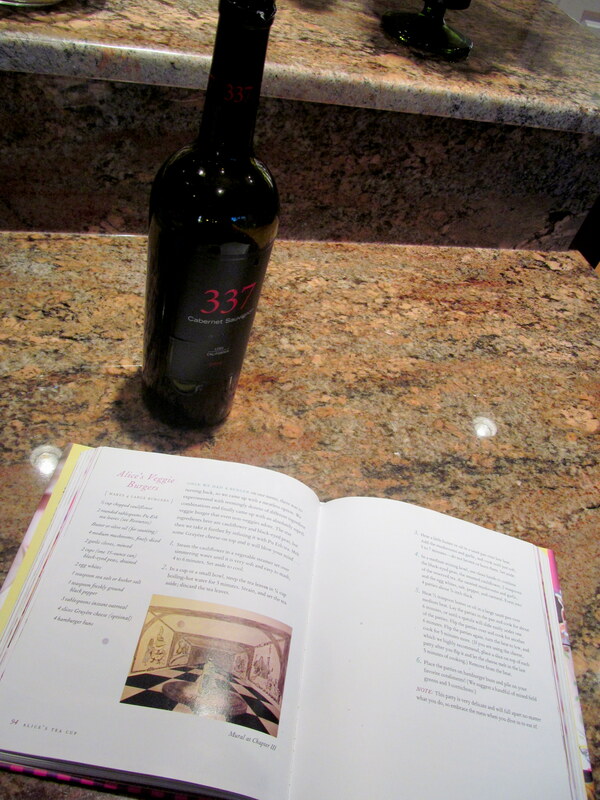 in the fridge while we worked on the food. Once the syrup was done, all we had to do was add it to a pitcher of Prosecco with a splash of OJ, and we had Peach Tea Bellinis! 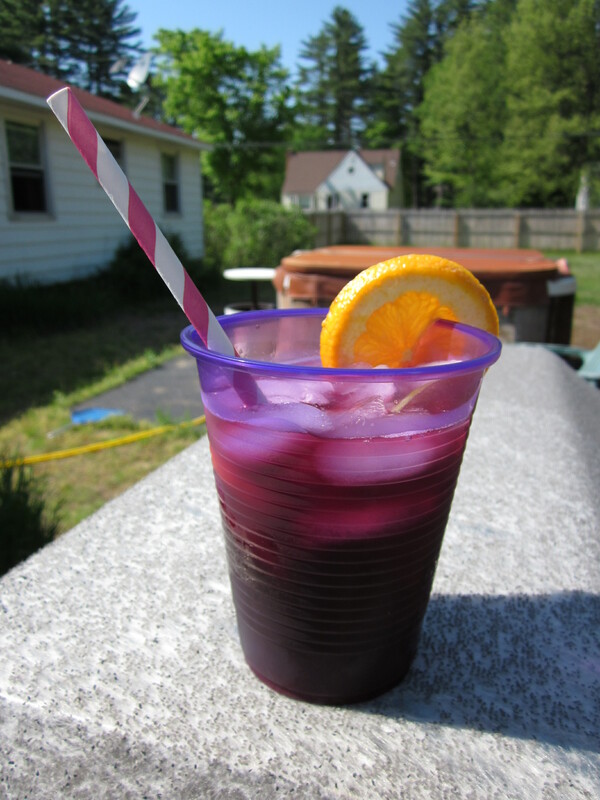 We also had the idea to add our leftover berries to our drinks! Despite a few incidents with the oven timer (AKA forgetting to set it, that’s what happens when your mind is stuck on bellinis…), our scones came out looking like REAL scones! So proud. We each took a bite and literally swooned. They turned out so well!! 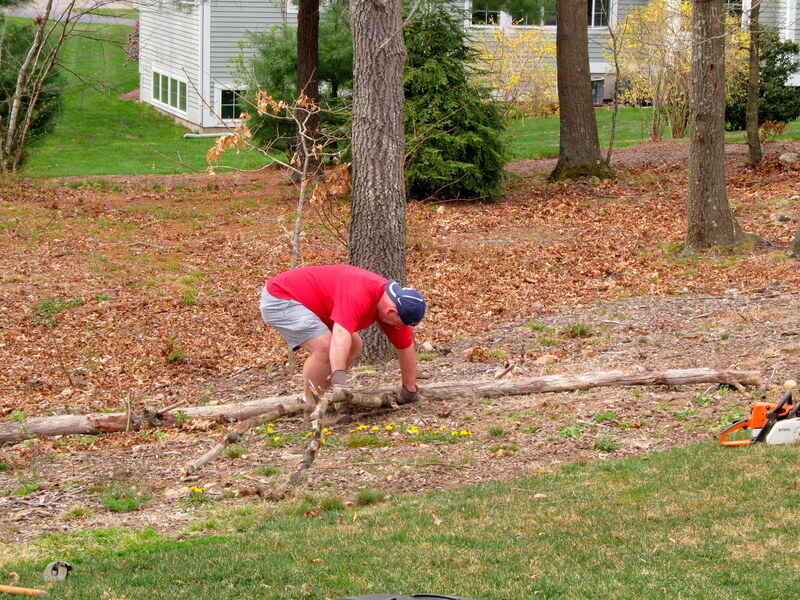 Kim’s mom joined our little tea party, but her dad was too busy being a manly-man and attacking trees with a chainsaw to notice. Typical dad behavior! 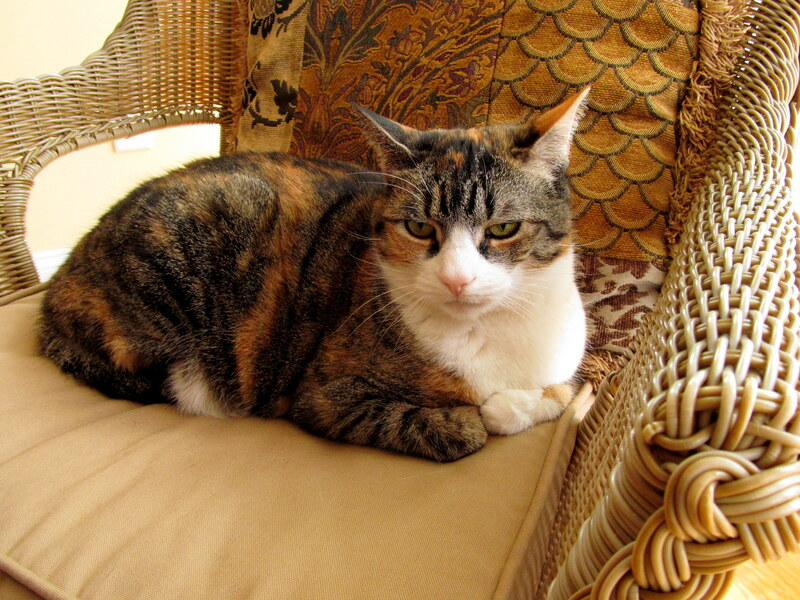 We also asked Kim’s cat Cali to join us, but she not-so-politely declined. 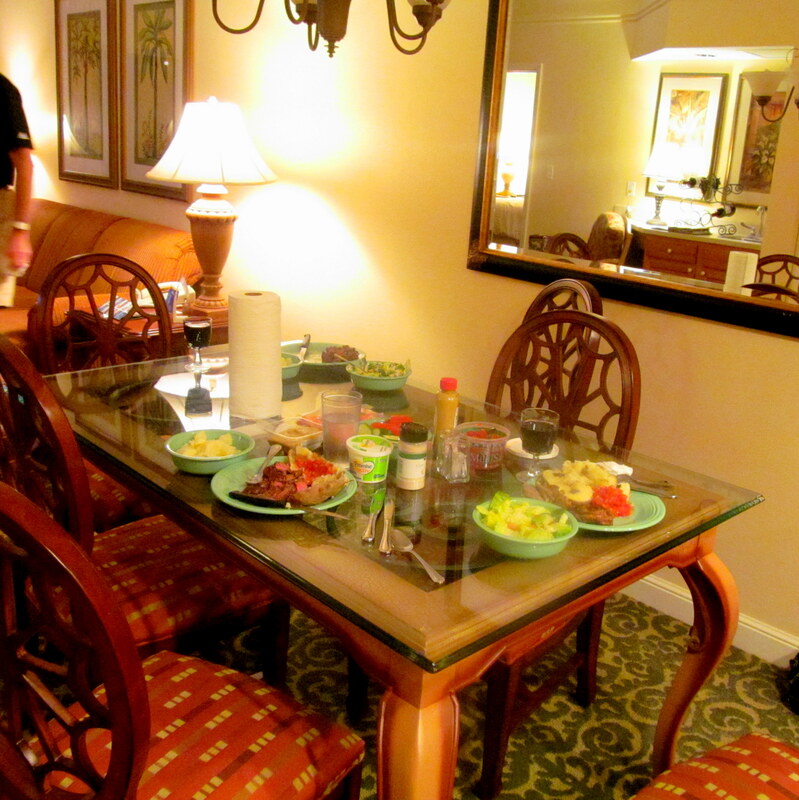 Don’t worry, our meal wasn’t just carbs and alcohol and fruit. Kim’s mom donated some tasty rotisserie chicken she had on hand in the fridge. 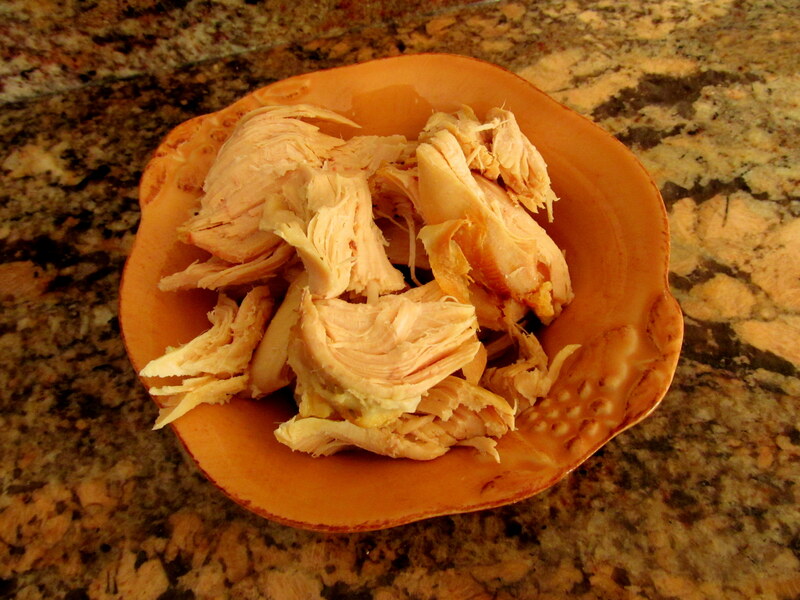 I had completely forgotten how much I love rotisserie chicken. 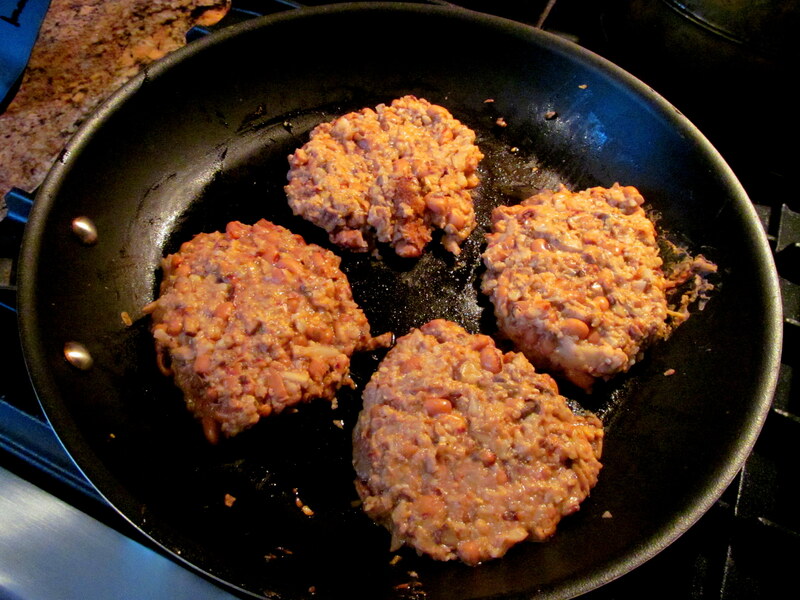 A super random, but super lean and protein-filled, addition to our meal! 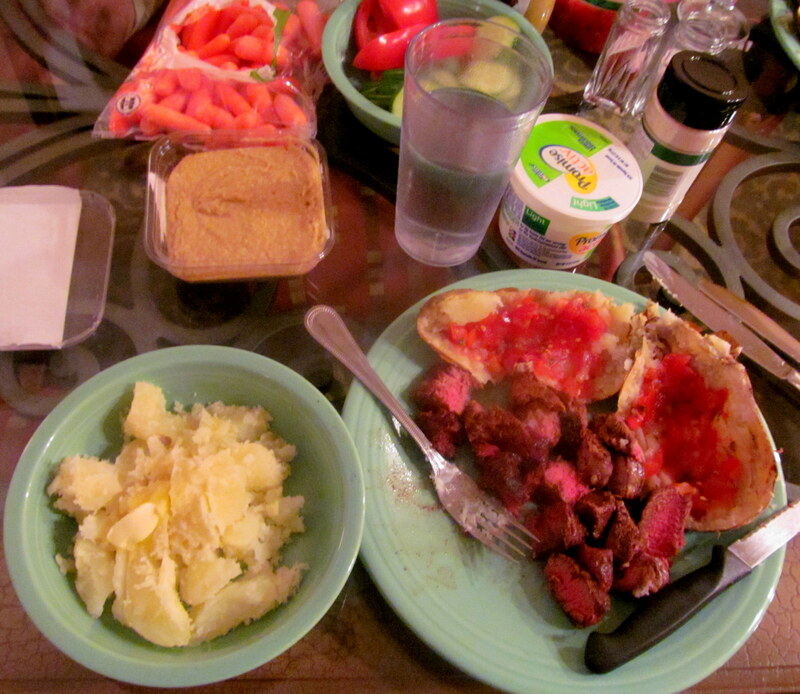 But maybe not as pretty as the rest of the meal…. 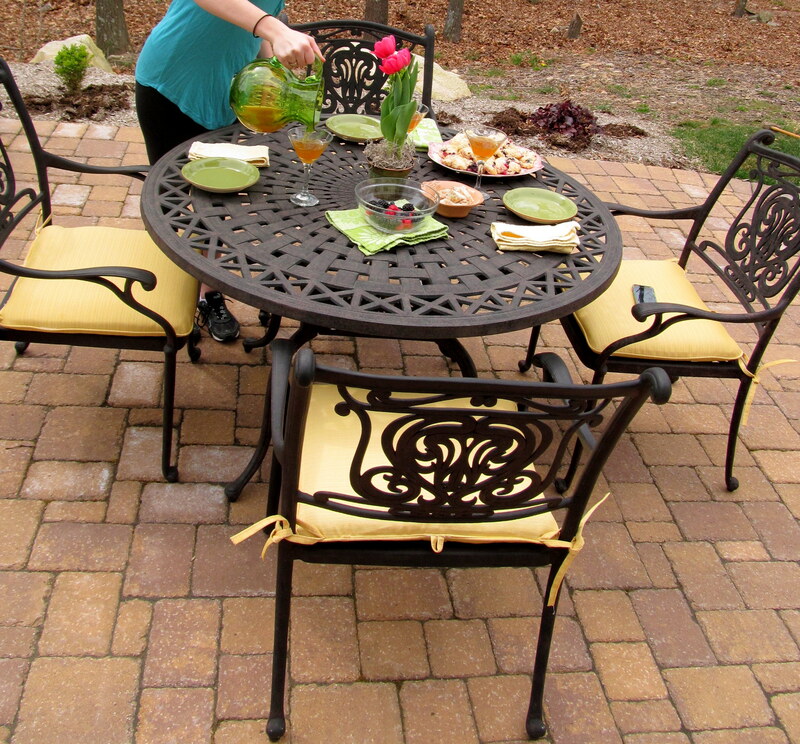 Now you can continue to be impressed…it was a nice day, so we got a cute setup going outside. Complete with background music AKA Mr. Bronson’s chainsaw. 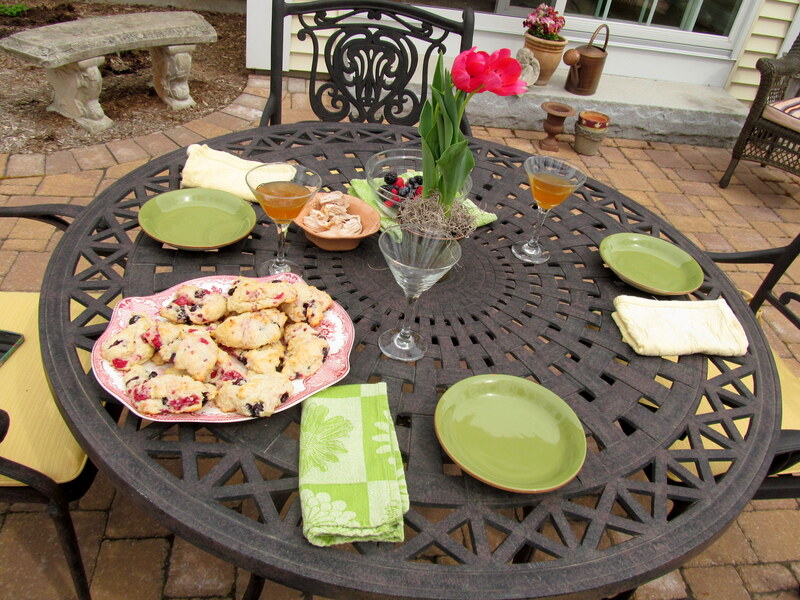 It was really rewarding to sit down with Kim and her mom, savor our drinks and scones, and enjoy and appreciate our work in the kitchen. OK, so I may be too lazy to cook, and I do still prefer to pay others to do it for me, but I understand the pride one gets from putting something special together! 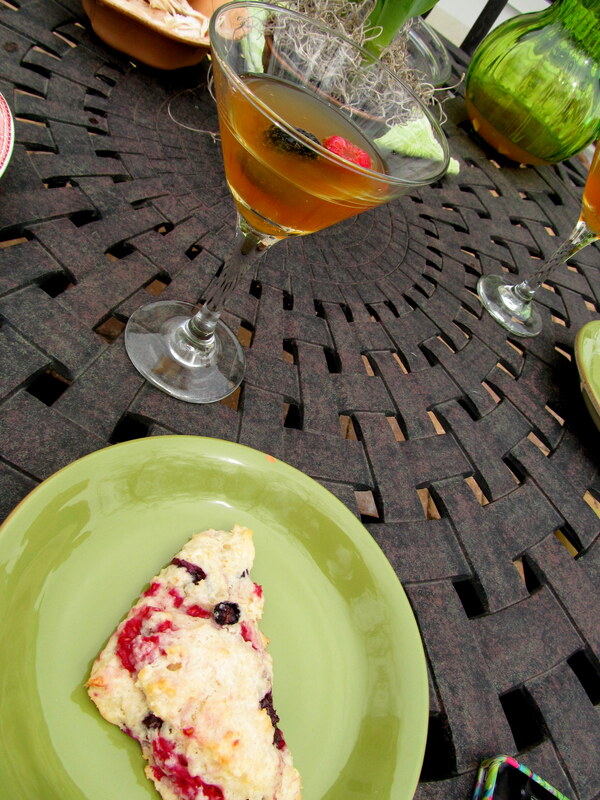 I helped myself to a few scones, some chicken, and a few bellinis…when in Rome, right? Or, when in Kim’s backyard on a Sunday afternoon. 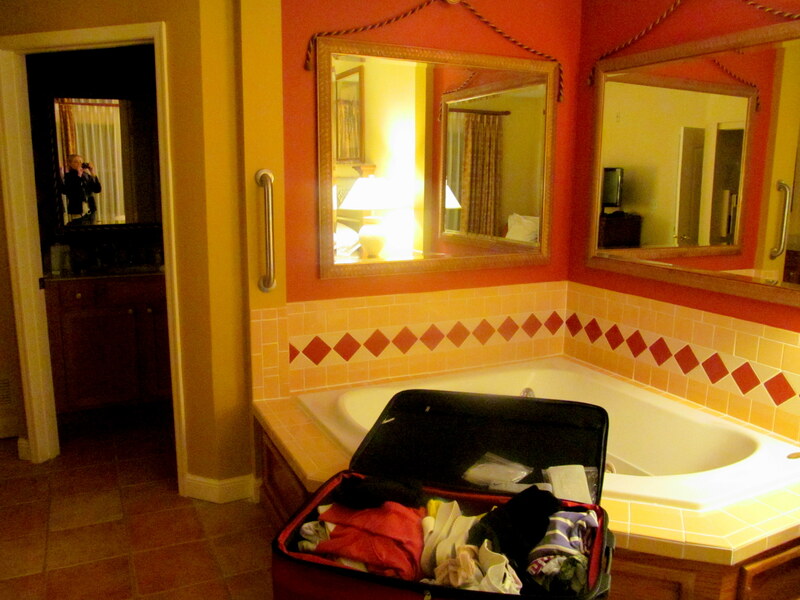 And since I’m more likely to be there than Rome, I’m gonna roll with that. 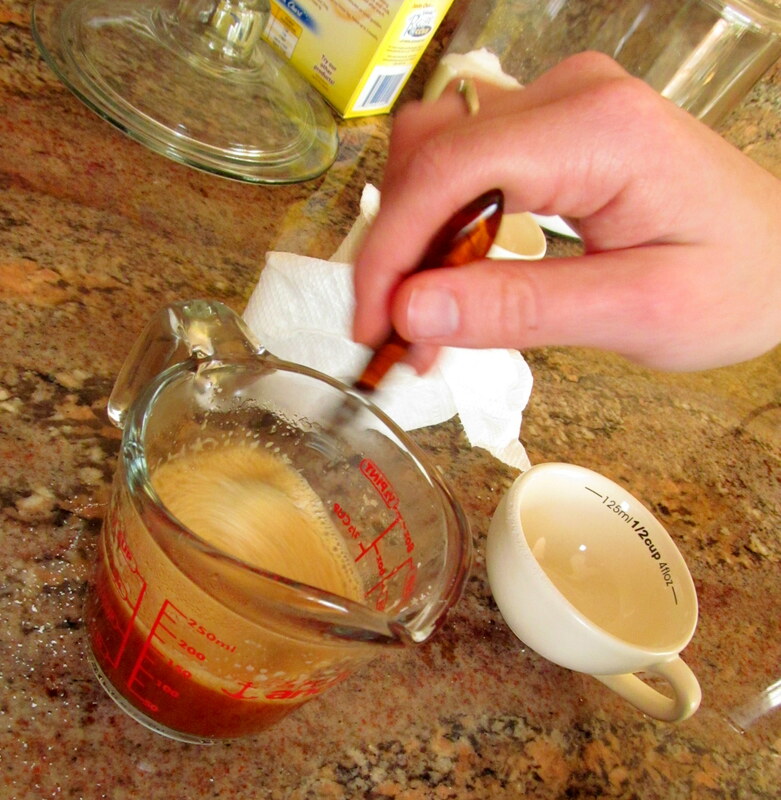 Have you ever made a food item or alcoholic beverage that used tea as an ingredient? Or been to a restaurant that does the same? 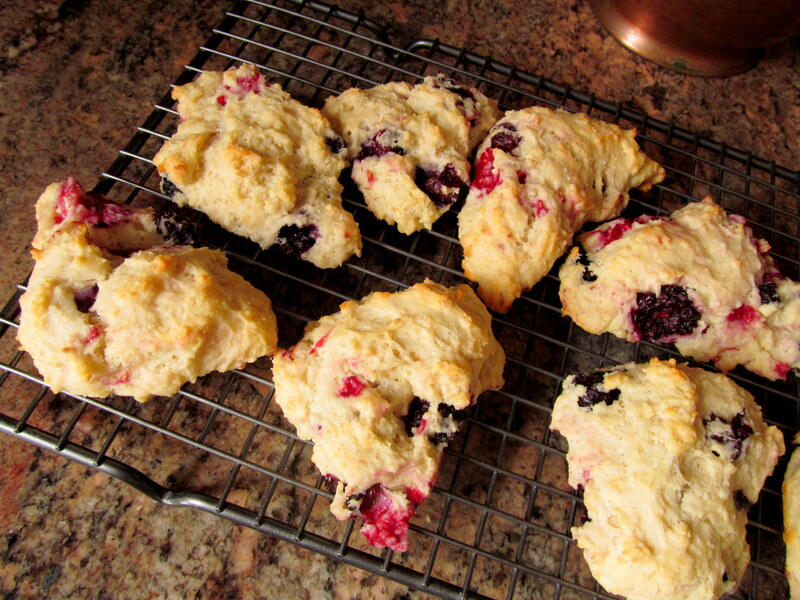 What is your favorite kind of scone? 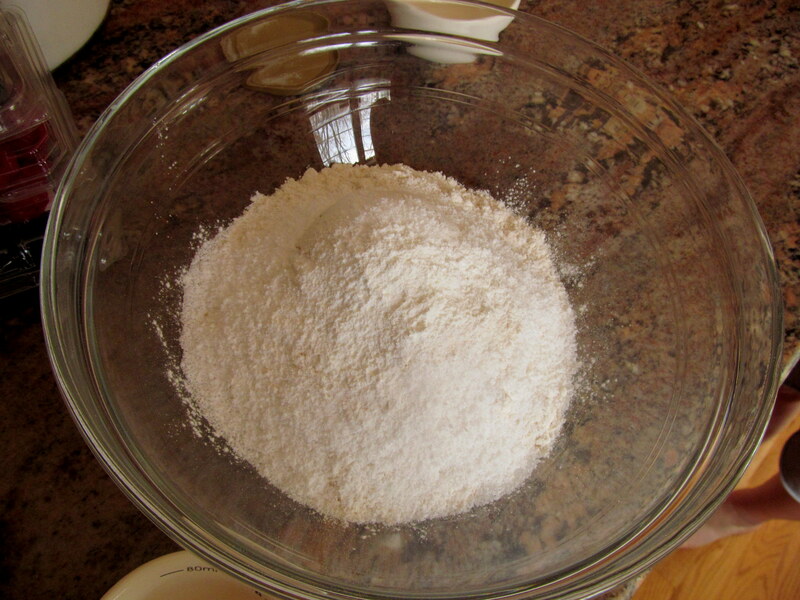 What’s the last baked good you made? The last cocktail? 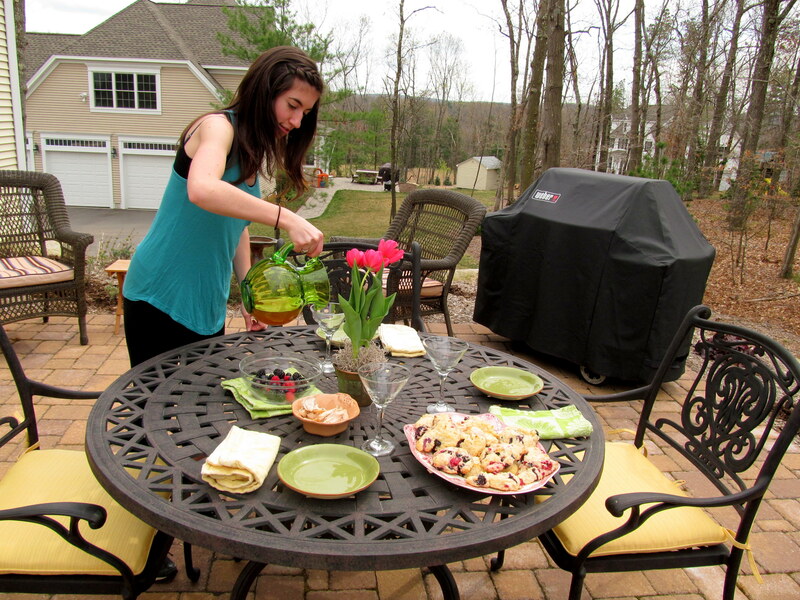 Did you miss yesterday’s preview of my next big foodie event, Mohegan Sun BBQ Fest? Head here to check it out! 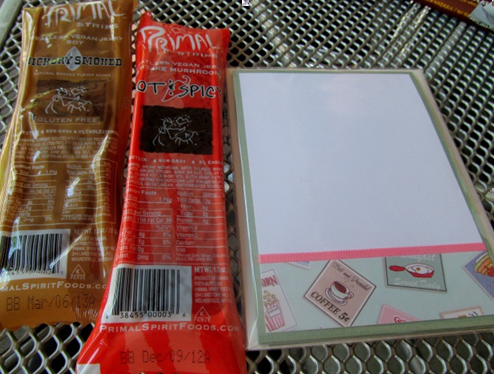 I am so excited to write about what I got from my Foodie Pen Pal this month…you’ll see why. But first, a quick explanation of what this is about – Lindsay‘s Foodie Pen Pals program is a great way to meet fellow bloggers and try new foodie treats, whether they are local or just something your grocery store doesn’t happen to carry. Don’t forget to go here to find out how you can join this amazing program. It’s completely worth the ~$25/month (food + shipping) that it costs to participate! 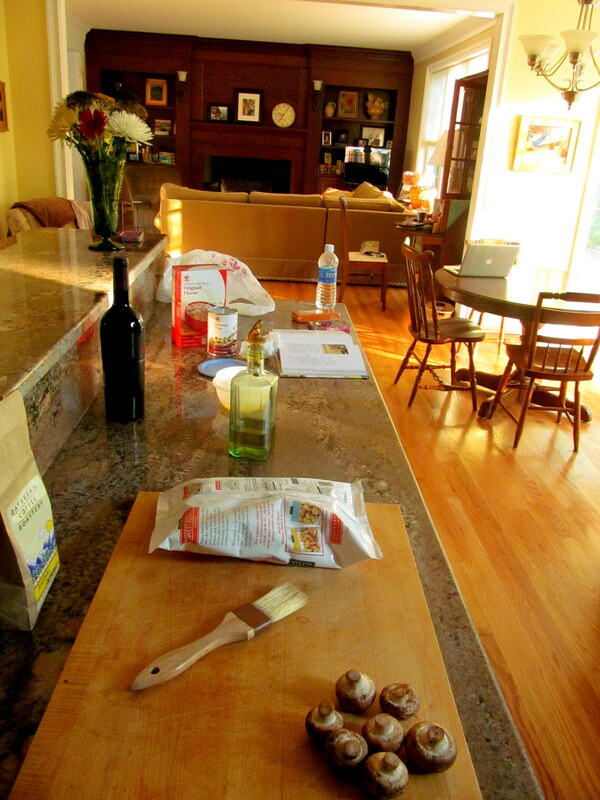 No offense at ALL to the other foodie pen pals I’ve had…you’ve all been wonderful. 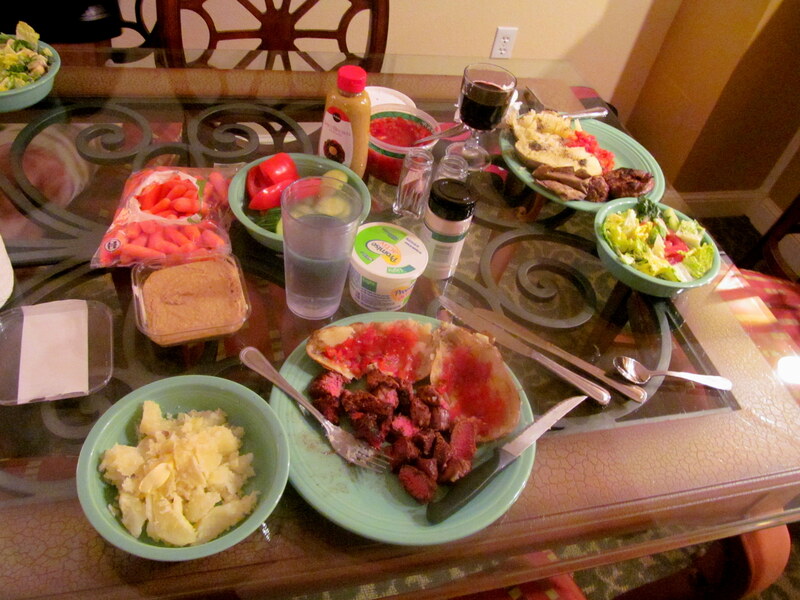 However, I have to call May the BEST month of the Foodie Pen Pals program I’ve ever experienced. That’s because, ironically enough, no pen was required for me to receive my package. 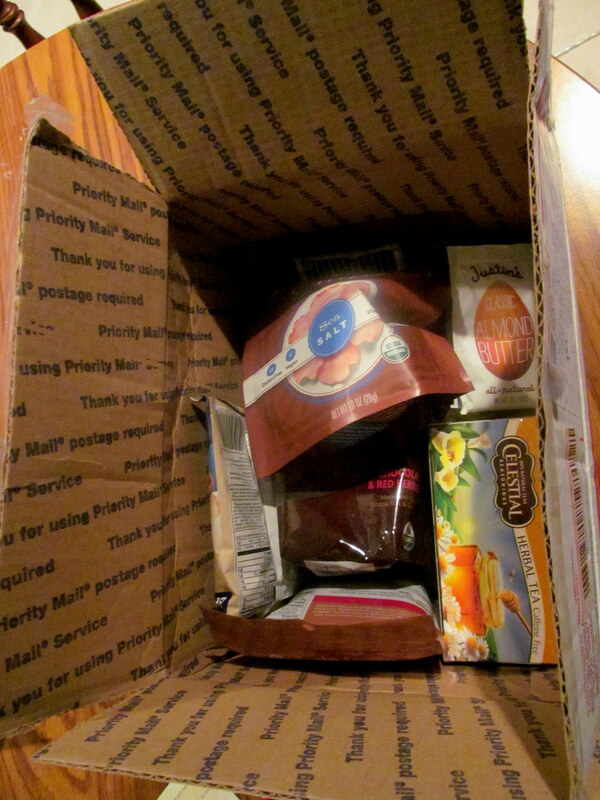 The pen pal assigned to mail me a box of foodie treats happened to live a few towns away! 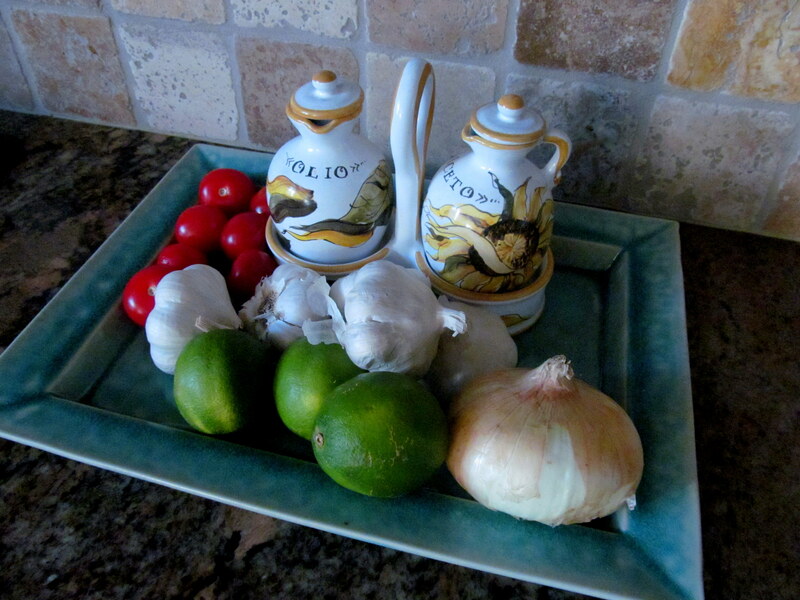 How often does a picture like the one below get to accompany a Foodie Pen Pal reveal? Two foodies and their tea! Yeah, that’s what I thought! 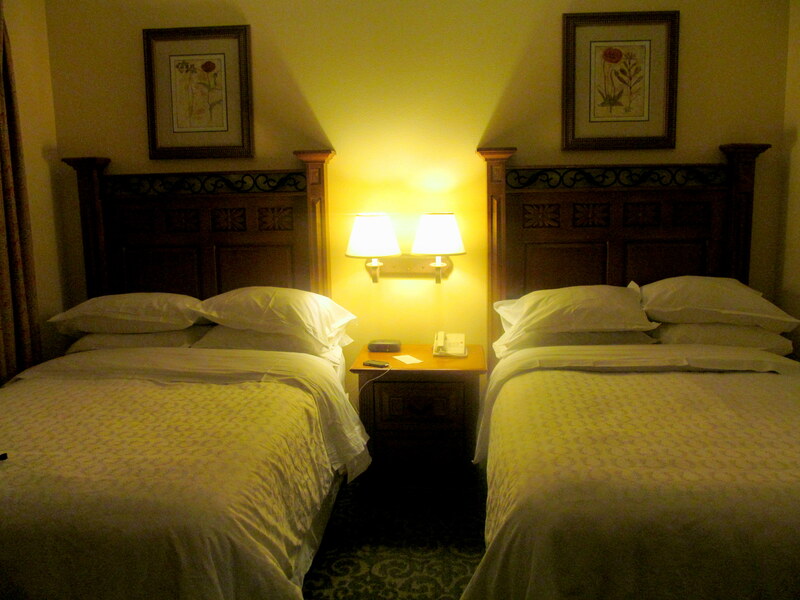 When my pen pal Michelle emailed me to ask for my preferences, she mentioned she lived nearby. I immediately suggested we meet up in person, and was glad that she was into the idea too. 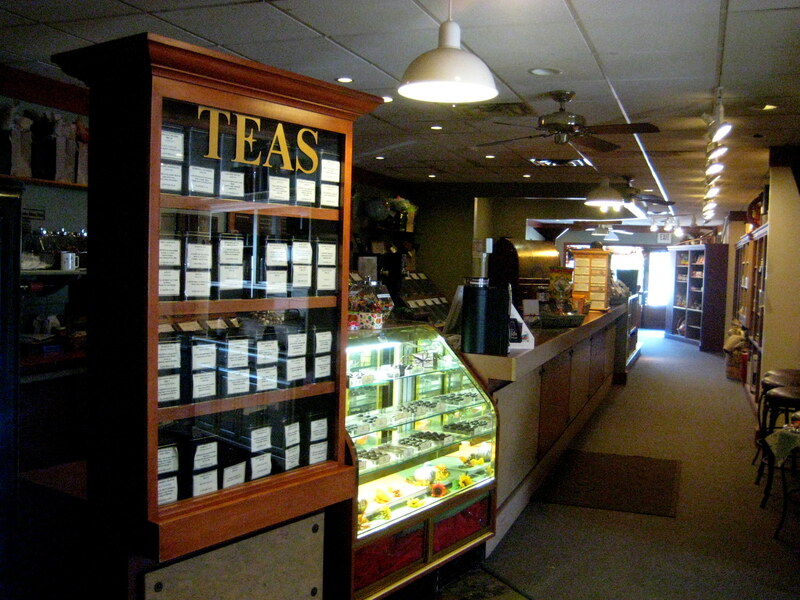 We made plans to meet in West Hartford’s picturesque Blueback Square at The Green Teahouse, a special loose-leaf tea shop that I’ve visited a couple of times in the past. 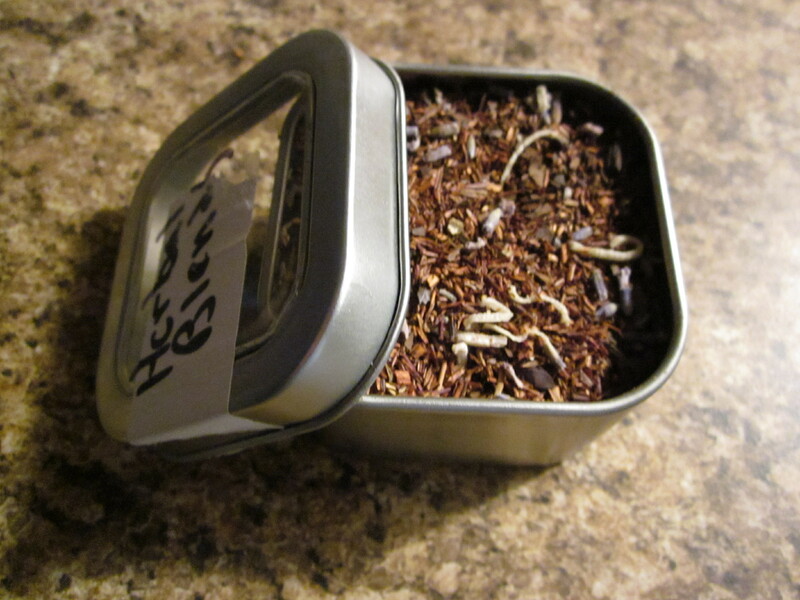 Our loose leaf tea blend. Monkey’s Chocolate and Banana Split, a match made in iced tea heaven. We also share similar taste in teas, because it was easy for us to quickly select a blend that the friendly employee promised would make the world implode. He was right! 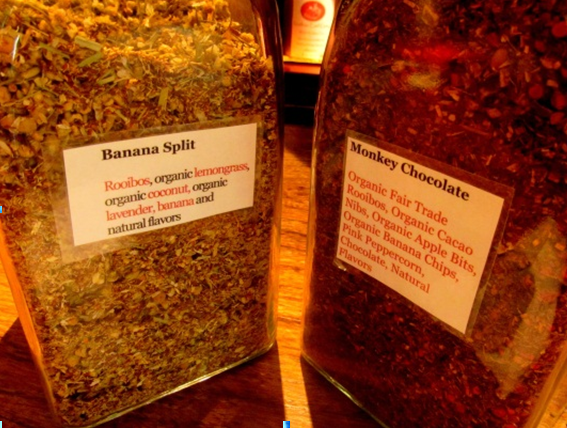 We ordered two iced tea blends of Monkey’s Chocolate and Banana Split, lightly sweetened with honey. Check out those fantastic whole ingredients! 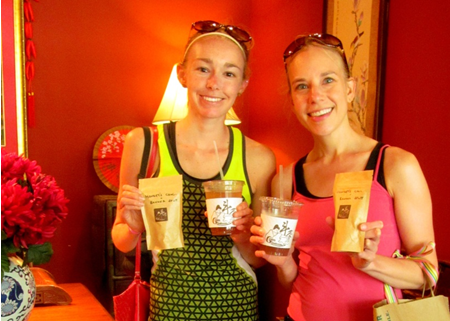 As part of my pen pal package, Michelle was a total sweetheart and contributed her Living Social deal to purchase our iced teas, as well as an ounce each of the blend for us to make at home. I’ve already made one attempt to re-create the tea (again, as an iced drink) on my won, and I definitely didn’t make it strong enough. Now I know for next time! I need a LOT of this yummy flavor. 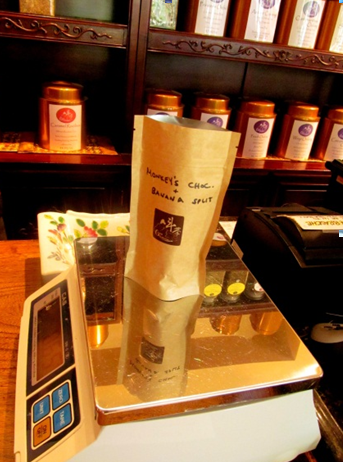 Our friendly sales associate measures out our blends to take home. The guy who helped us also shared that for groups of four to ten people, at $30/person, the Green Teahouse will do Chinese tea ceremonies! Sounds like such a fun girl’s day. 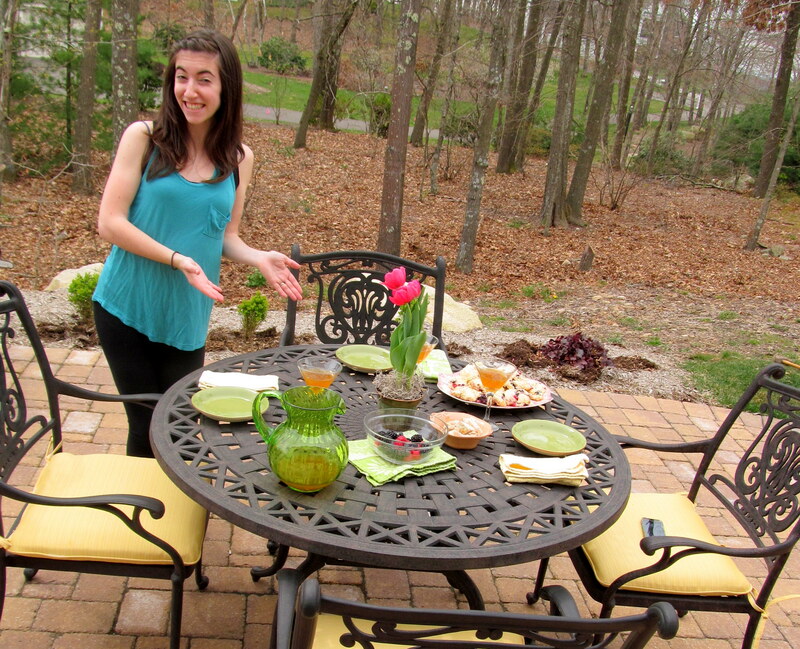 We took our iced teas outside because it was such a gorgeous day. 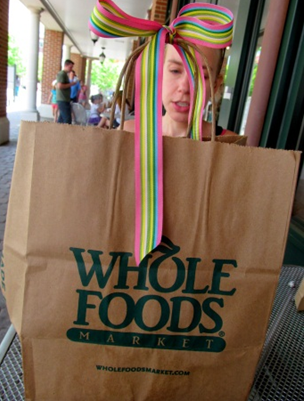 I loved that Michelle could watch my reaction as I opened the package, which came in a Whole Foods bag and was tied with an adorable ribbon. 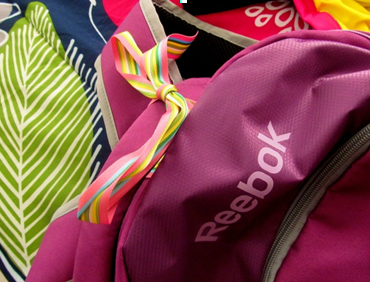 I have since transferred the ribbon to my Reebok backpack! I spotted something QUITE incredible with my first glance into the bag. Yes, that’s Lilly Pulitzer! What I really loved about Michelle’s package for me was the fact that she really read my blog to help her determine what goodies I’d enjoy most. She just put so much effort into it! I was touched. For example, Michelle could tell from my constant posting about Daybreak that I am a coffee-lover, so she selected a coffee thermos for me. 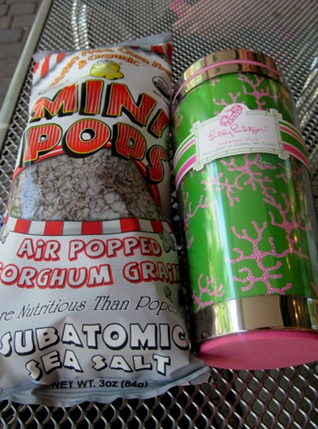 And I think she could also tell that I’m a Lilly girl 😉 The borghum gum sea salt air popcorn sounds SO interesting to me! Michelle says it’s great and I can’t wait to dig in some evening when I need a snack for a movie night. I love salty, savory food! The savory snack and coffee theme continued. How adorable are those printed notes?! What’s even MORE awesome is that Michelle designed them! She does printing and design on the side – another touching part of the package, and I also was in desperate need of new cards to use for future Foodie Pen Pal mailings. 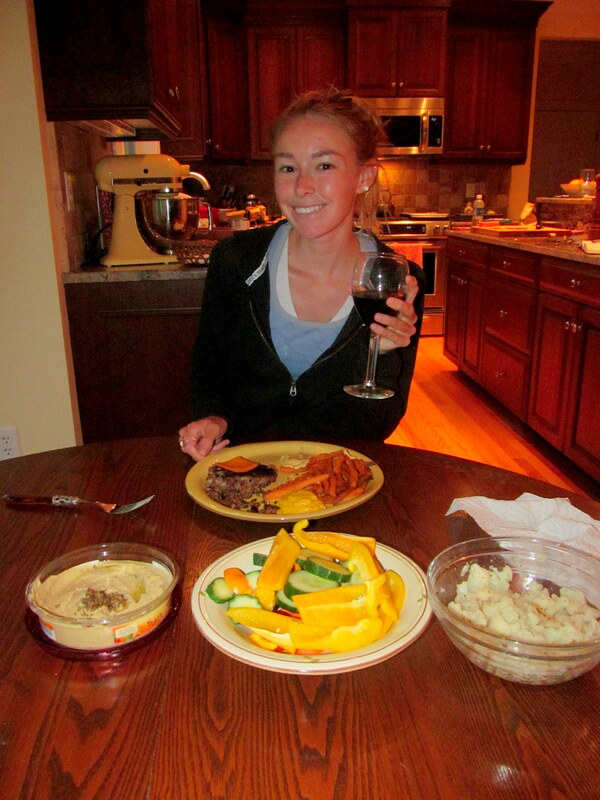 The non-GMO soy and mushroom jerky was right up my alley – healthy, unique, and savory. I’ve already had the hickory BBQ soy flavor and can’t wait to try the spicier mushroom one next – but will have to follow Michelle’s recommendation and have a glass of milk ready nearby. 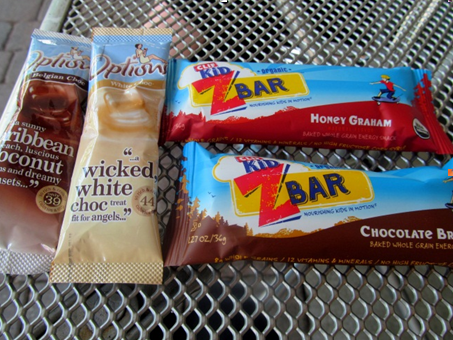 I was so very excited to see the Z Bars in the package because I have seen them ALL over the blog world but have never picked any up because I tend to have a steady supply of bars at my house from samples, giveaways, and other Foodie Pen Pal months. The nutrition stats are quite impressive and I had the honey graham version before Step class one day, and had a GREAT class full of energy! Michelle studied in England for awhile and wanted to give me some international brands of food, so she chose low-calorie hot chocolate packets. I’m so excited to try them, especially the Caribbean coconut flavor – oh man. I got pretty damn excited when the last thing I pulled out of the bag was a Tupperware container. 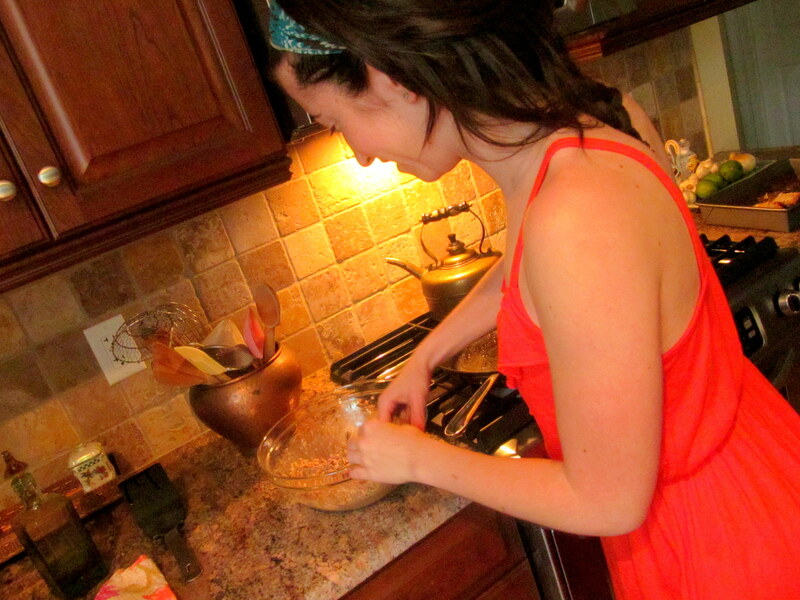 Michelle is just so cute and perky and I could totally see her being an excellent baker and cook. 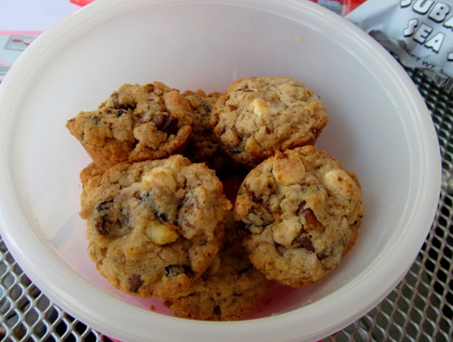 Yup, that was confirmed when I opened the container and caught a glance of the above: Michelle’s Kick A** Cookies with oats, flax seed, dried figs, walnuts, and both dark and white chocolate chips! I brought them to a grad party I attended later that day and had two myself. They didn’t last long among my friends! So hearty, satisfying, and yet also indulgent-tasting. Props, Michelle! 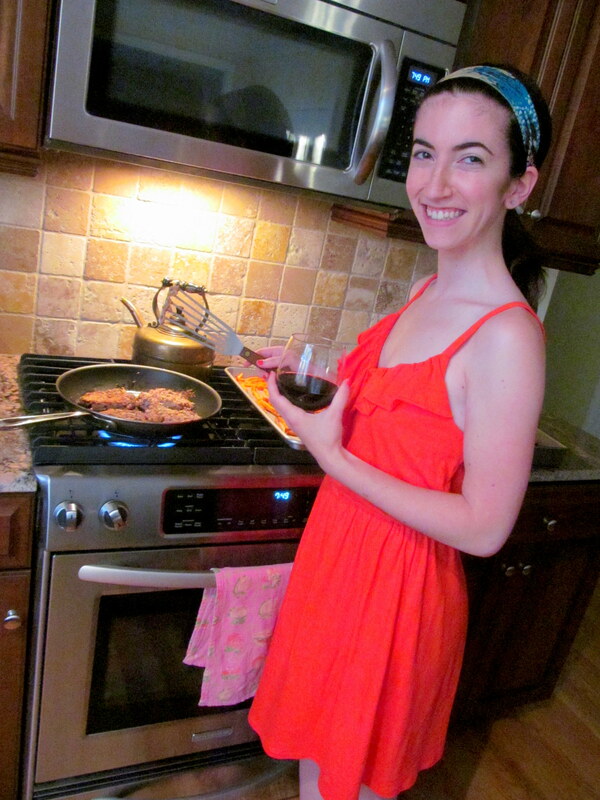 I’m so thankful to have been matched up with a Foodie Pen Pal in May who has ALSO become a “real life” friend! 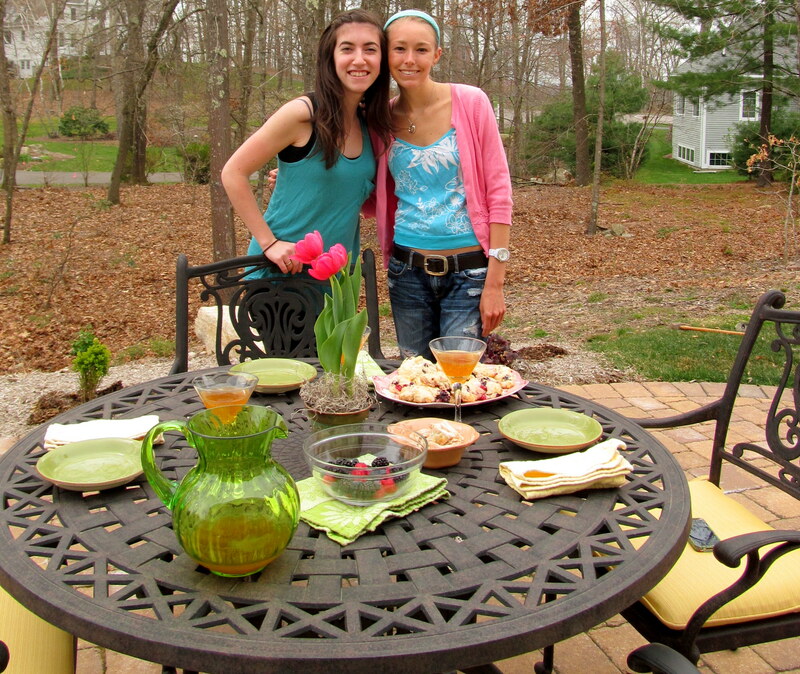 Michelle and I plan to hang out again…and, hint hint, I wouldn’t mind sampling some more baked goods! 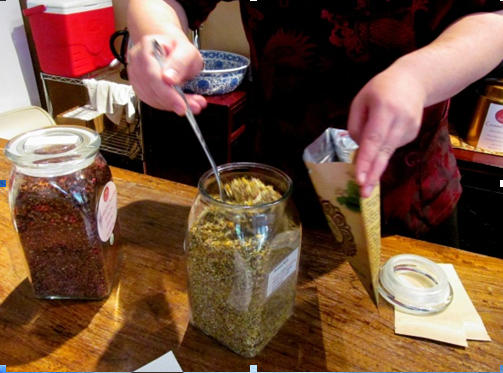 And don’t forget to check out The Green Teahouse’s tea blog – an interesting read even for those who aren’t from CT! 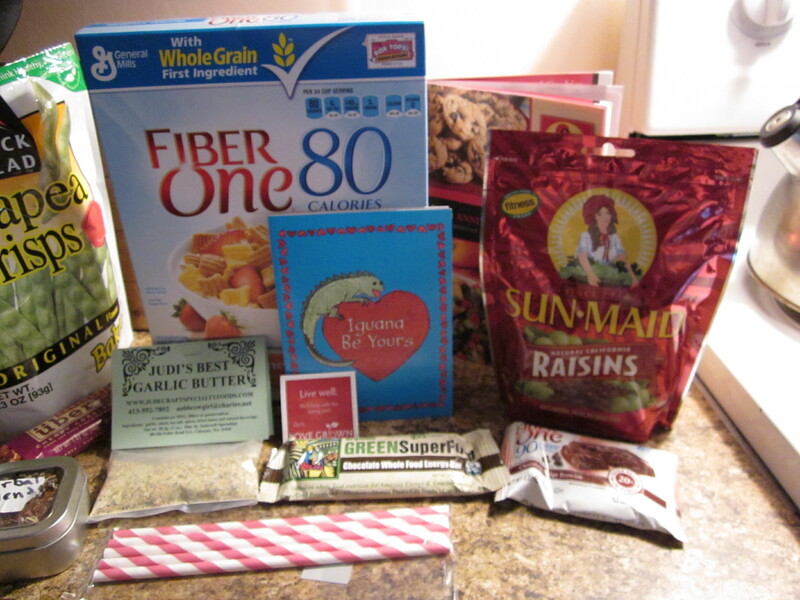 Stay tuned – this afternoon I’ll be publishing a guest post by the reader I sent goodies to this month! 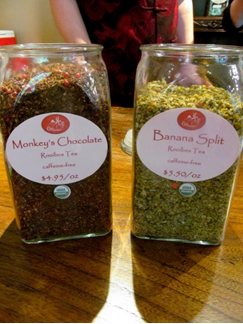 Have you ever visited a loose leaf tea café/shop? 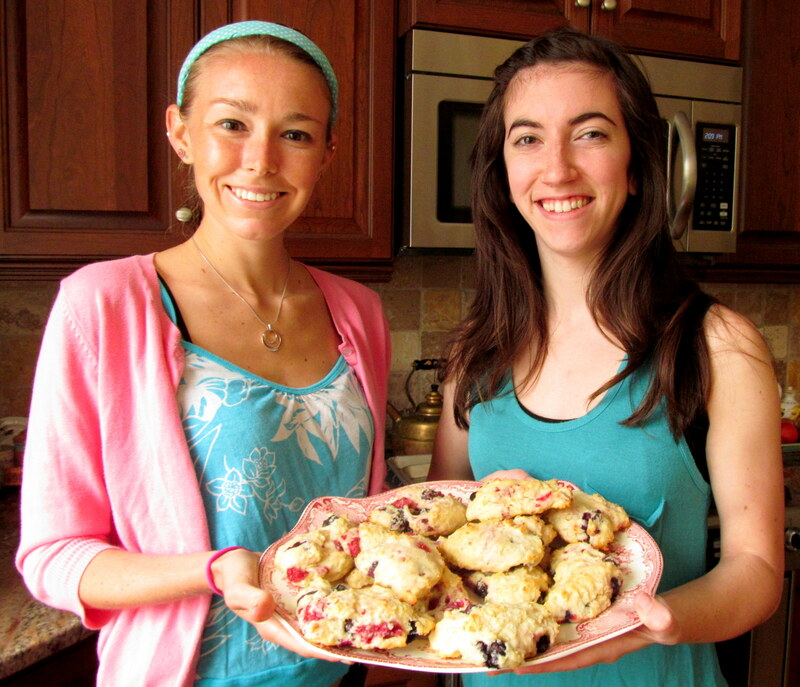 Have you ever been matched up with a Foodie Pen Pal who you were able to meet with in person? Have you ever tried any of the treats I received? Sorry for the lack of a post yesterday! 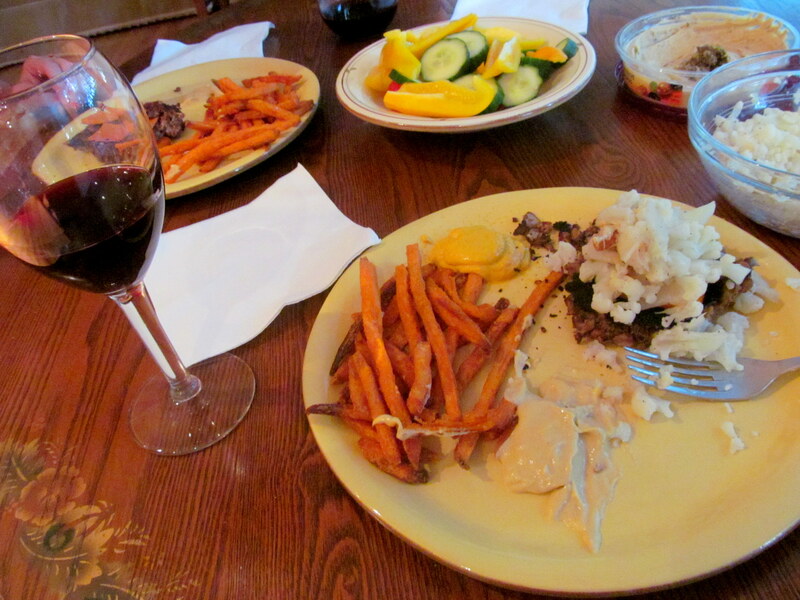 It was a busy day – I had work (punctuated by a gorgeous lunch break outside, oh this weather makes me so happy), a trip to the gym (Group Power and the elliptical), and q-time with my parents to watch the most recent ep of “Mad Men” and eat a taaasty meal. Thanks Mom! I felt a bit sore when I woke up this morning, and the stretching during P90X Yoga (my usual Tuesday morning thang) felt good, but all the leg-burning action also probably didn’t help my soreness. I kinda sorta definitely LOVE being sore though, so bring it on! Half moon gives me the HARDEST time in this workout – anyone else? Source. Let’s get to the goods. I am always tweeting about Daybreak Coffee Roasters and mentioning them on my blog, because they are a part of my weekend routine. In fact, I was recommending them to the Gossip Girls of West Hartford this morning! But I thought you all may want to learn more about my favorite local coffee shop (which Heather has already fallen in love with). Each Saturday and Sunday morning I work out, and then head to Daybreak with my laptop and homework in tow to get MBA/blog-related work done and sip on delicious coffee in the form of a nonfat blanc made with whatever flavored coffee they have “on tap”. I don’t usually like flavored coffees, but Daybreak roasts their own and the flavors taste so fresh, natural, and perfect. If I don’t like what’s already brewed, they will event let me choose any flavor bean I want to be French pressed! 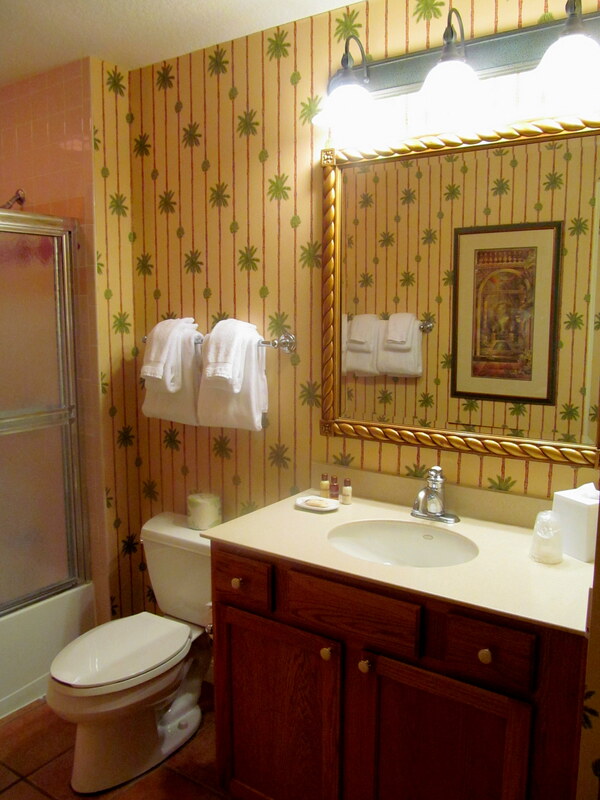 It doesn’t get much fresher than that, friends. 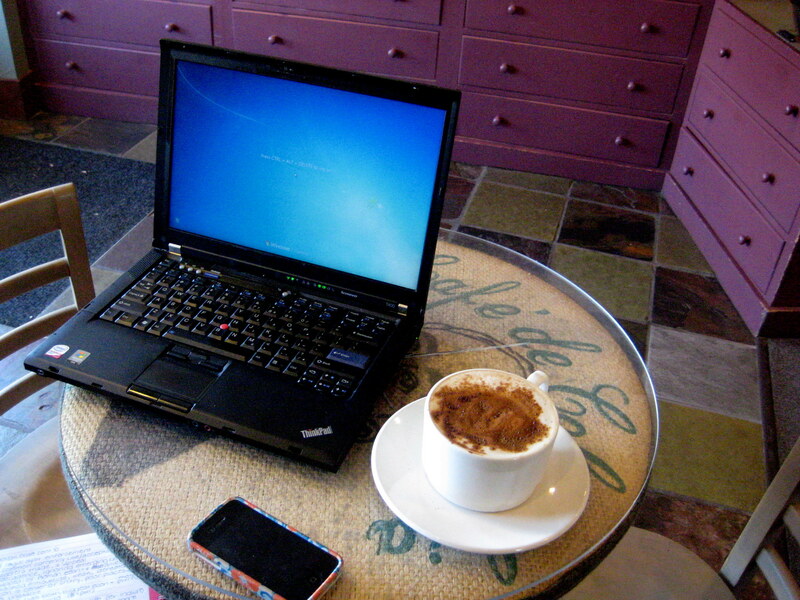 Nonfat amaretti blanc, with a side of homework, at Daybreak Coffee. 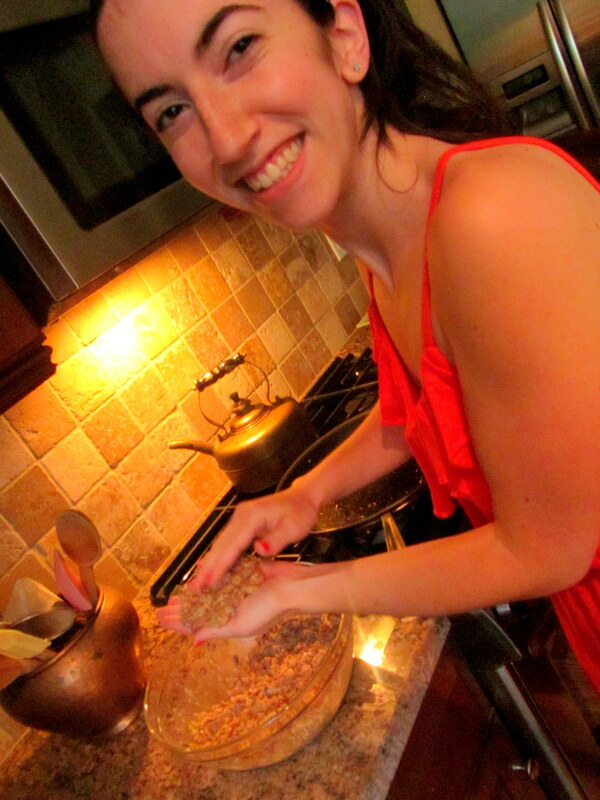 My favorite flavors, to name a few, are amaretti di sicilia, chocolate banana, toasted butternut, and pecan pie. 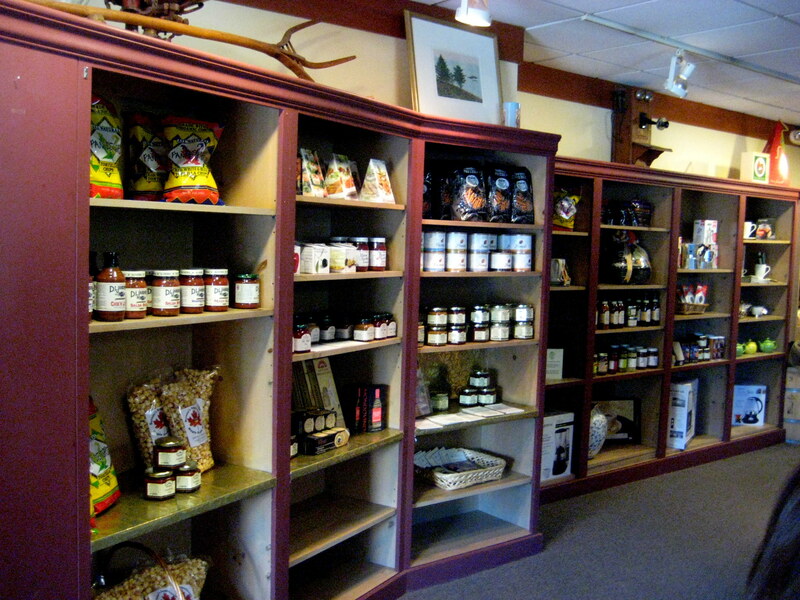 The vibe of the cafe is fantastic, with cute local foodie gifts lining the walls. 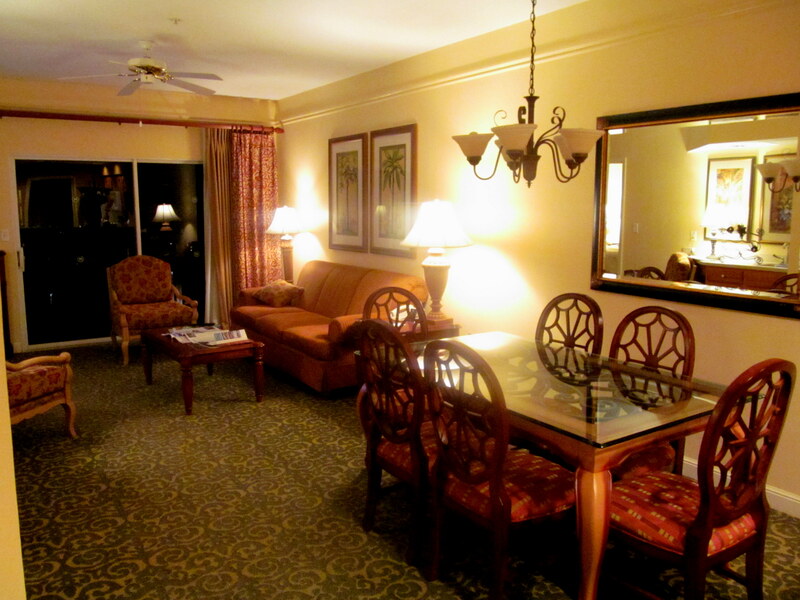 The staff is so kind and helpful! They know me at this point, and my order. They put up with me when I stay there for hours at my favorite sunny table and only order one drink. It’s so comforting to listen to their friendly rapport with the shop regulars – it really creates a sense of community. I have friends I’ve met at Daybreak, and friends I’ve grown closer with because we kept seeing each other there. The owner, Carmelo, even offers patrons with dogs sitting at outside tables a bowl of water for their pups. Amazing! Carmelo by the coffee roaster. How cute is that sign above?! 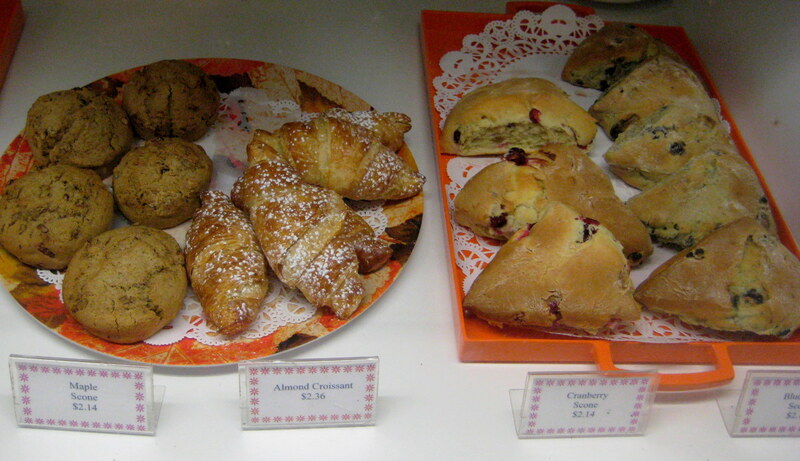 Though I’ve never had any, Daybreak also specializes in freshly-baked pastries. Judging by the number of people who order them I can only begin to guess how good they are. 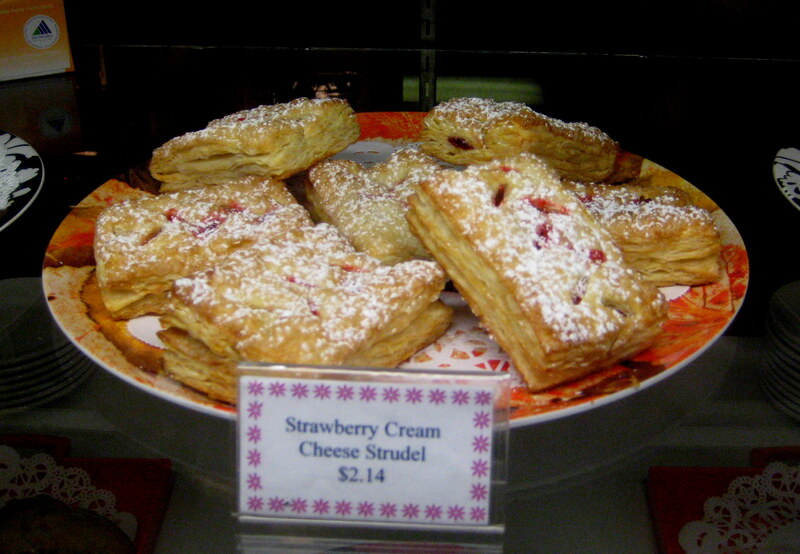 They are most famous for their scones (pictured below at right). 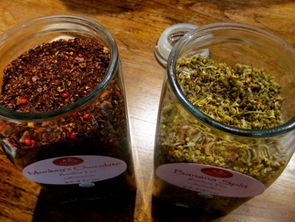 In case you weren’t already impressed, Daybreak also houses an extensive collection of loose-leaf teas. And those items in the glass case next to the teas are gourmet chocolates! Is there anything you can’t find here? They even sell Chobani, Odwalla bars, and Sports Beans to cater to the many athletes who stop in before, during, and after their outdoor workouts in the center of town. And if you’re gluten-free, that’s no problem – a few packaged gluten-free treats are available! 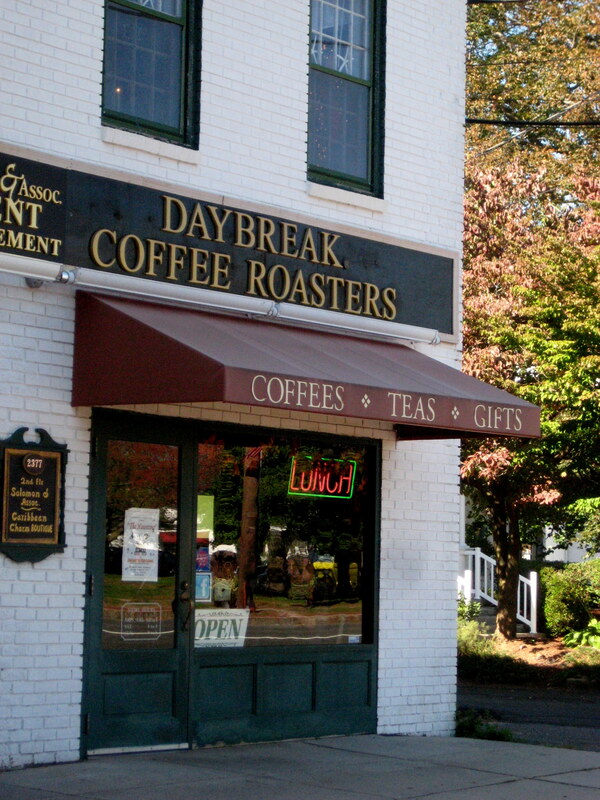 Daybreak Coffee is such a great part of my weekend routine that I wouldn’t give up in a second – any morning that I can’t make it is so disappointing. If only they were on my way to work so I could go on weekdays too! What’s your favorite local cafe to get coffee and/or tea? Don’t forget to read last night’s post about Daily Feats, a new social networking rewards site that helps you meet your goals AND earn bonus points to use towards rewards and/or charitable donations. The post contains a code good for 50 free bonus points at (also free) registration! 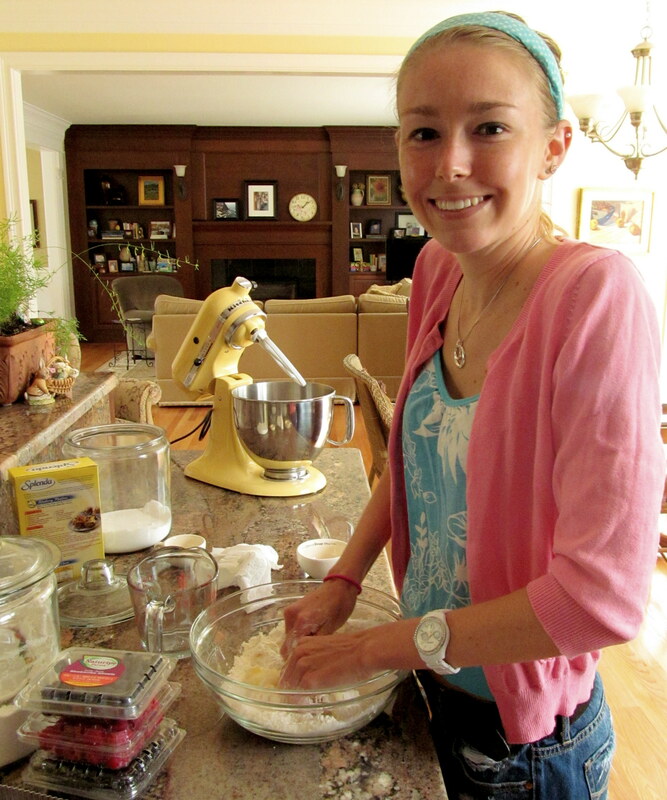 And you can find out what I got my foodie pen pal, Halley of Blunder Construction, here! 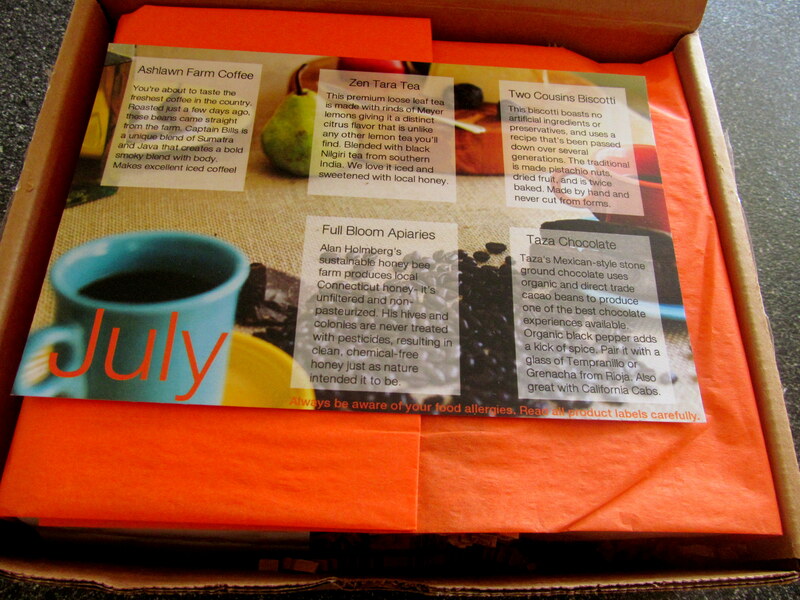 Not only do I get a Birchbox every month, but I also get an even better kind of box – from my Foodie Pen Pal! 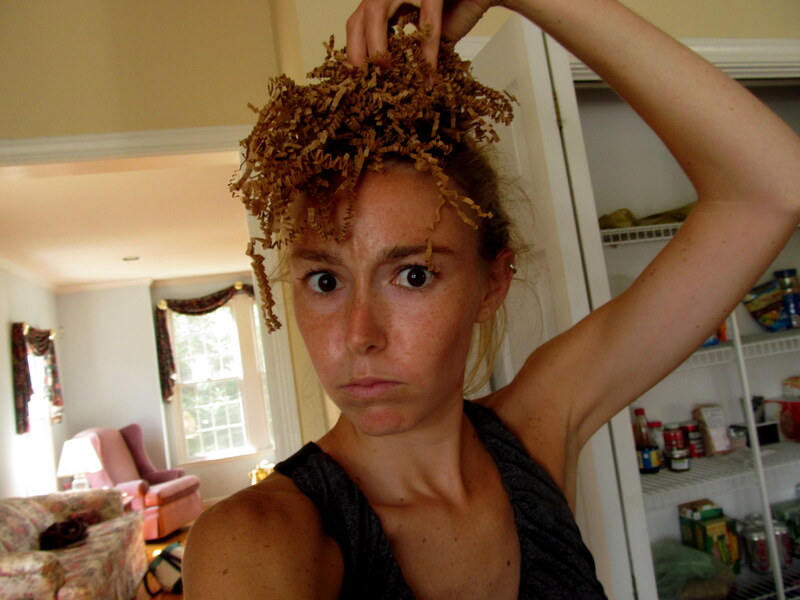 Lindsay of The Lean Green Bean has taken on QUITE the project – she now has over 200 participants! Bloggers and blog readers alike can participate (just last month, a reader without a blog did a guest post for me so that she had somewhere to share what I sent her). This month, my pen pal was Julia of A Girl with a Stethoscope. 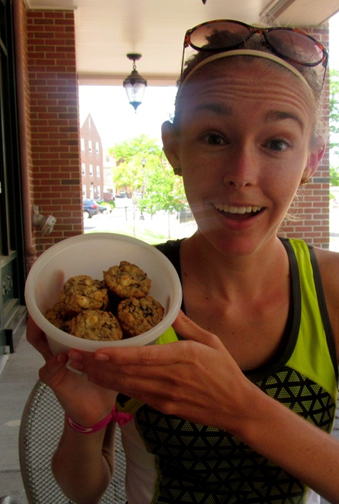 She is a new graduate nurse with a love for running and eating. One of my favorite things about this program is the way it connects me with other bloggers and their blogs that I may never have found! 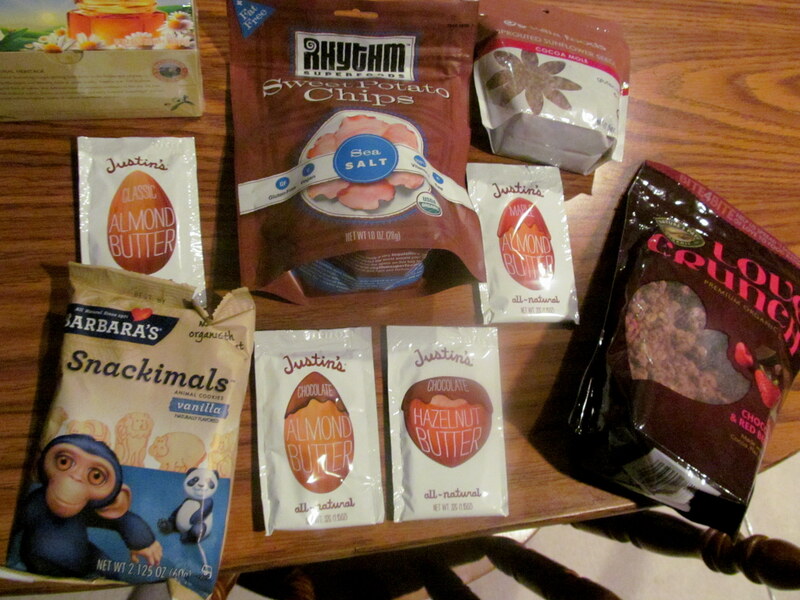 I really like her blog AND her taste in food…check out all the goodies she sent me! 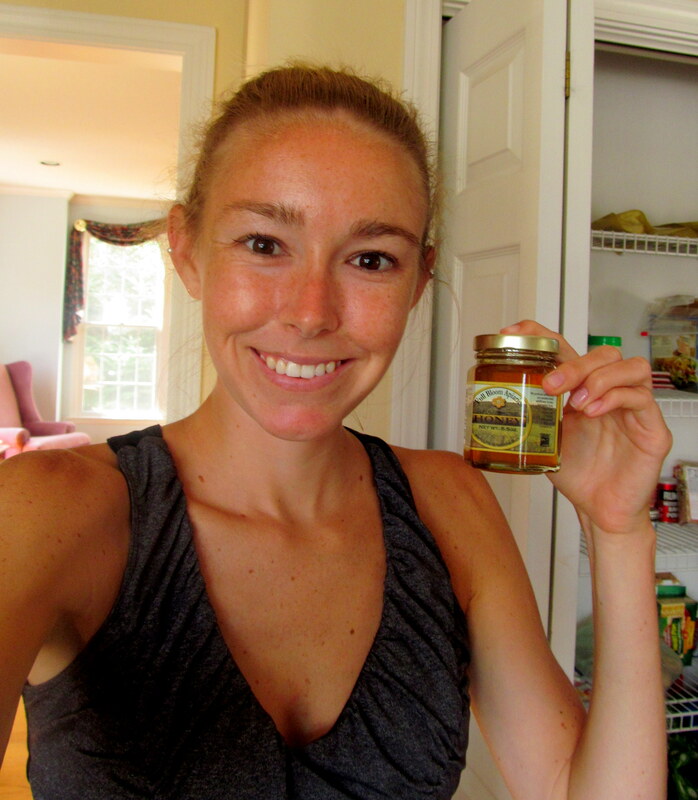 Celestial Seasonings Honey Vanilla Chamomile Herbal Tea: YES I am so excited to try this! 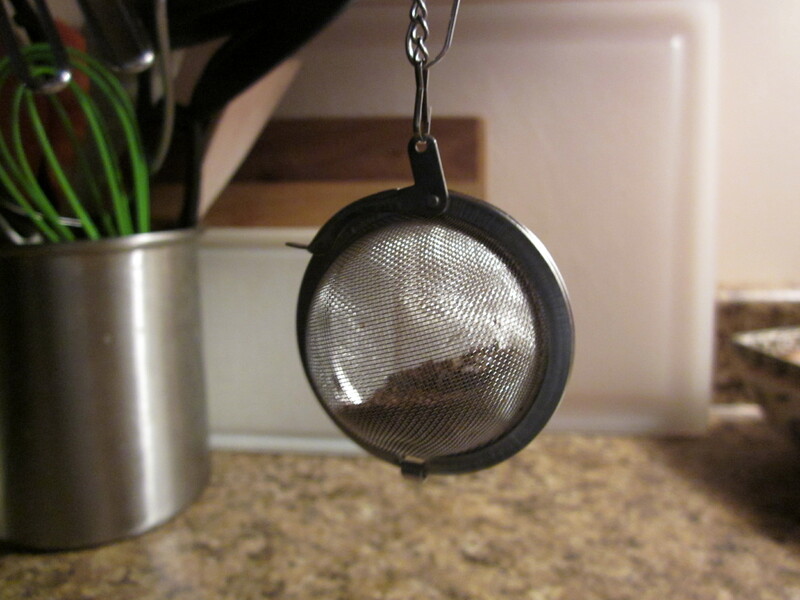 I adore honey vanilla teas and the fact that this is decaf will make it perfect to enjoy in the evenings. I have loose leaf herbal tea but to be honest, have not made a single cup because I have been to lazy to prepare loose leaf! Maybe I’ll start drinking tea more often now that I have a bagged variety. Rhythm Superfoods Sweet Potato Chips: I was super psyched to try these out, but they weren’t exactly my cup of tea (wrote that and then realized that phrase would fit better in the above bullet) because despite the fact that these are the Sea Salt variety, they weren’t salty enough! However I’m sure someone in my house who isn’t as hopelessly salt-addicted as me will end up polishing these off. The whole bag has just 100 calories! Kaia Foods Sprouted Sunflower Seeds: I know many bloggers out there are addicted to sunflower seed butter, and sunflower seeds themselves. I honestly haven’t tried the butter and have not had plain sunflower seeds since I was a picky elementary school kid who only ate Wonder Bread and buttered pasta. SO, what I’m trying to say here is, I’m very excited to try these because a) I’m way more open-minded now and b) these are a Cocoa Mole flavor! I think that these sunflower seeds would go GREAT in a plain Greek yogurt or cottage cheese snack. Barbara’s Snackimals: Funny story, I remember seeing these in Whole Foods when I was shopping for my foodie pen pal this month, and being curious about them. How convenient that Julia got me a snack bag! Another great mix-in for Greek yogurt/cottage cheese messes, or something nifty to keep in my cubicle for those emergency hunger situations. The vanilla flavor is definitely what I would have chosen myself. 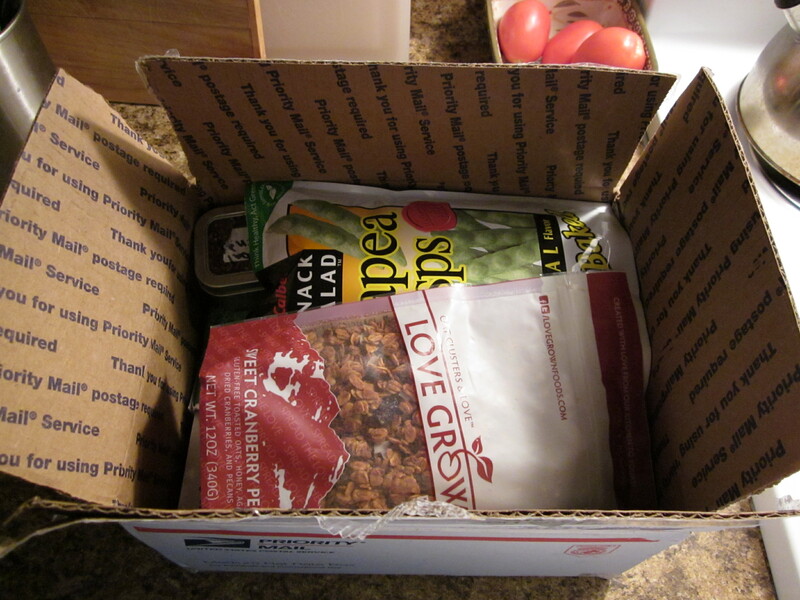 Nature’s Path Love Crunch Granola: And the snack ingredients keep on coming! Love the Dark Chocolate & Red Berry flavor…it reminds me of chocolate covered strawberries! I bet adding some chocolate syrup on top of this granola would be amaaaazing, maybe on top of a berry crisp…ooh, my recipe mind is churning! 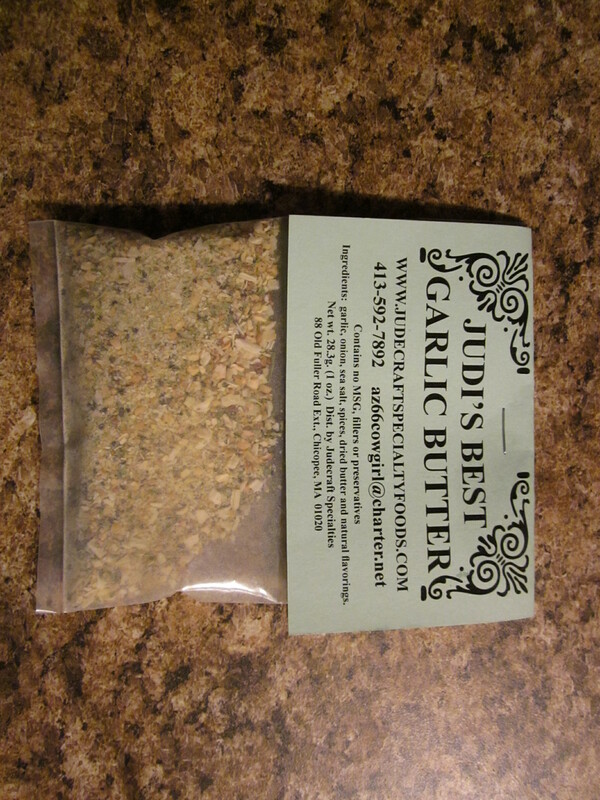 Justin’s Nut Butters: I saved the BEST for last! I have always wanted to try Justin’s nut butters and finally can. Julia was kind enough to send me several varieties! Even though I’m more of a PB fan, I am pleased to announce that I have started with the Classic almond butter variety and have been enjoying it on bananas. I don’t think I’d ever have it on something like bread, but paired with a sweeter component like fruit, the roasty salted almond flavor is definitely better to me than the last time I tried almond butter. I’m sooooo excited to try the chocolate hazelnut butter too. I think I’m going to save it for last! 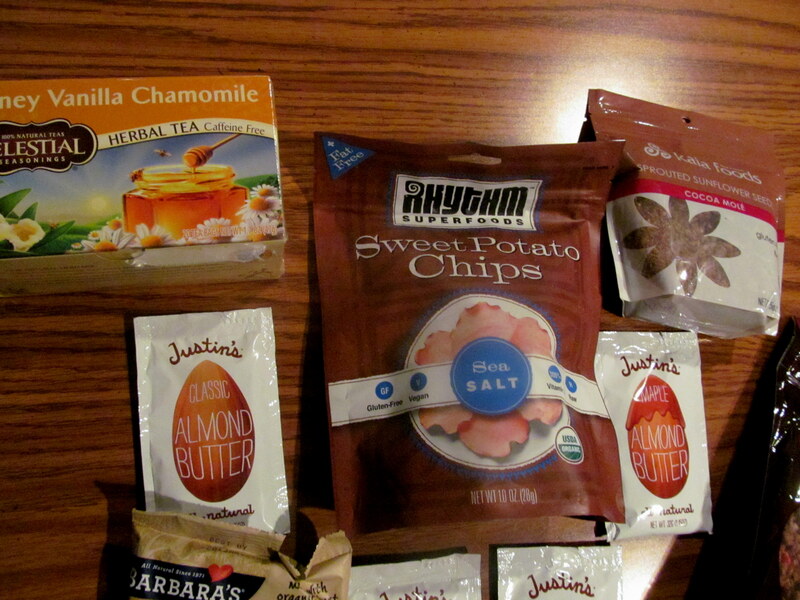 This month’s foodie pen pal package was great, and I already can’t wait for March. I also can’t wait to find out how my pen pal, Halley of Blunder Construction, likes her package – I think it’s the best one I’ve ever put together. Thanks again to Julia for going above and beyond, and sending me some fab goodies! –WHETHER YOU ARE A US RESIDENT OR CANADIAN RESIDENT. 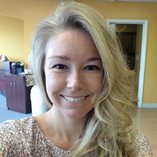 Have you ever tried any of the products I received?